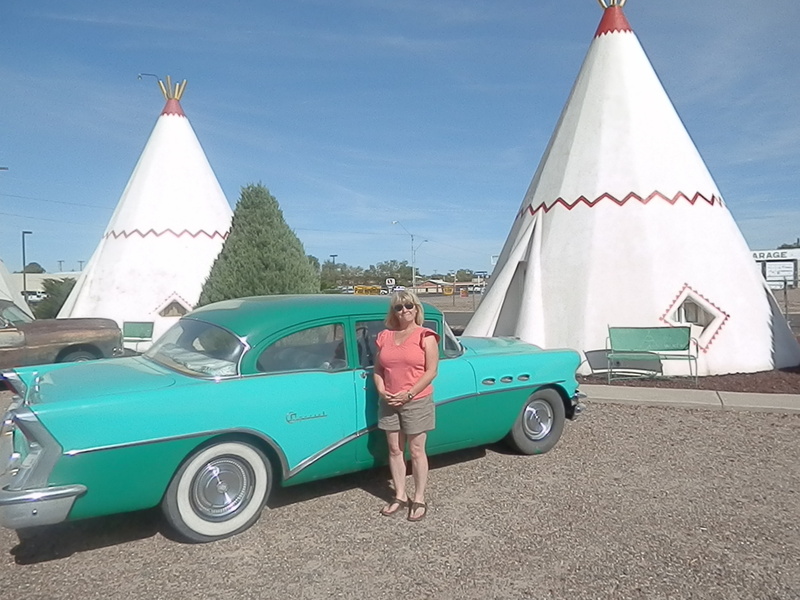 Our last day on the road and one on which we hoped to catch more vintage Route 66 sights before we said a fond farewell to The Mother Road. We had nearly 300 miles in front of us before we reached Las Vegas, where we had tickets for the Dark Star Orchestra concert in the House of Blues in Mandalay Bay at 8pm. 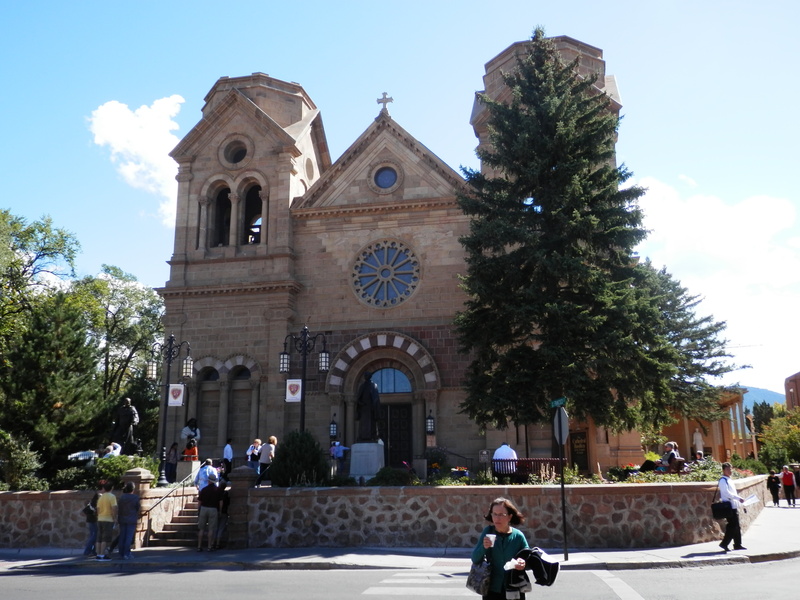 With that in mind, we left the Little America Hotel in Flagstaff at 8.35am, our earliest start of the trip. Before we joined the I-40 west we needed to fill up the car. As we had contracted to return it with an empty tank, we did not want to put in any more than was necessary. We estimated $30 should do the trick. Our first planned stop was at Bellemont, location for a classic scene from Easy Rider. Early in the movie Dennis Hopper and Peter Fonda pull up in front of the Pine Breeze Motel, hopeful of a room for the night. 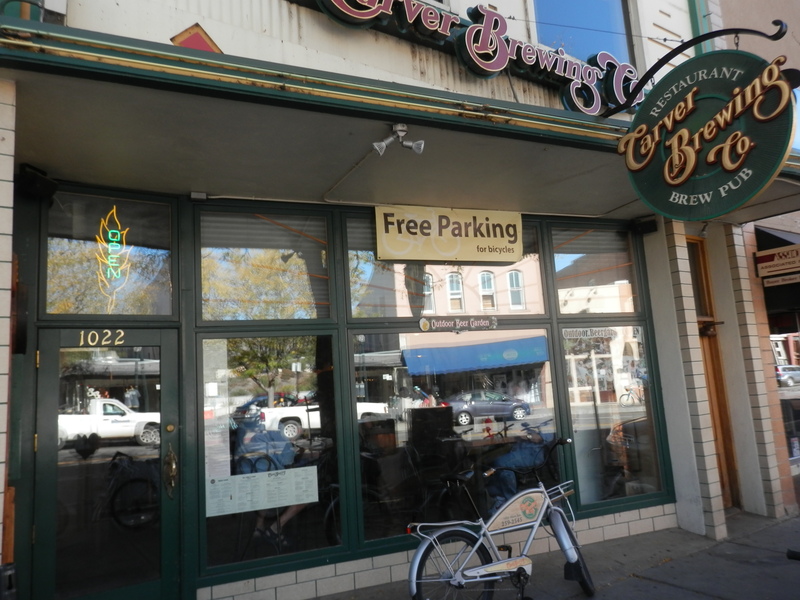 However, the owner, peering from within, spots their motorcycles and promptly switches the neon sign from VACANCY to NO VACANCY. Although the motel is now closed, the sign is still displayed at the nearby Route 66 Roadhouse Bar & Grill – which does welcome bikers. It is that we went in search of. We left the interstate at junction 185 as directed and followed the signs to Bellemont – or so we thought. Our first attempt ended in a pothole ridden track that ran out in a forest clearing. Undaunted, we crossed back over the I-40 and took the frontage road, but after two miles we reached a similar dead end. With no access to the freeway we were forced to turn back. We could not afford too many such fruitless detours on a day when we had so many miles to cover. At least this diversion had given us the opportunity, on an empty stomach, to witness a group of cows defying the flies to feast on a rotten deer carcase. The other Route 66 destination that we were anxious to visit was Williams, just thirty miles from our starting point. Taking exit 165 we entered the town, whose welcome sign stated that “You are wanted in Williams”. And so we were. After parking the car we started to walk down the main street in search of a suitable breakfast venue. 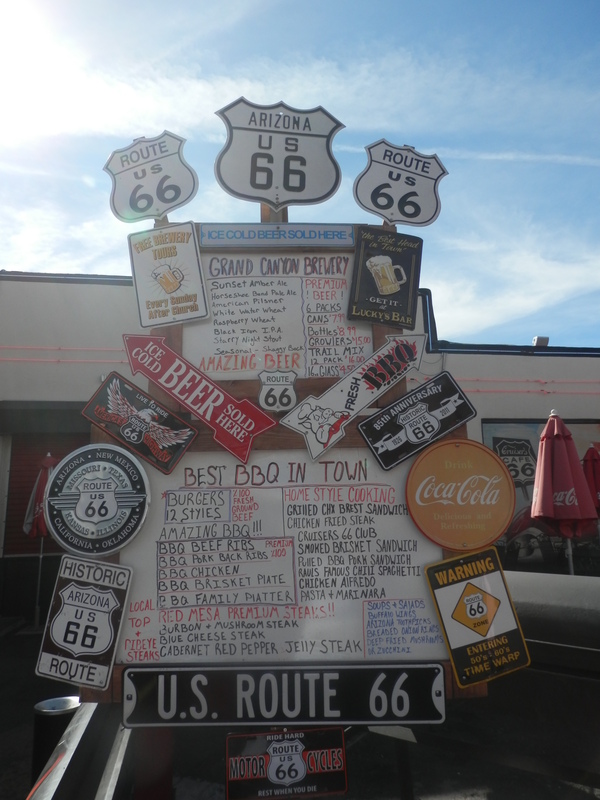 We were tempted first by Goldie’s Route 66 Diner, but the sight of ten bikers roaring into the forecourt in front of us suggested we might have to wait a while! 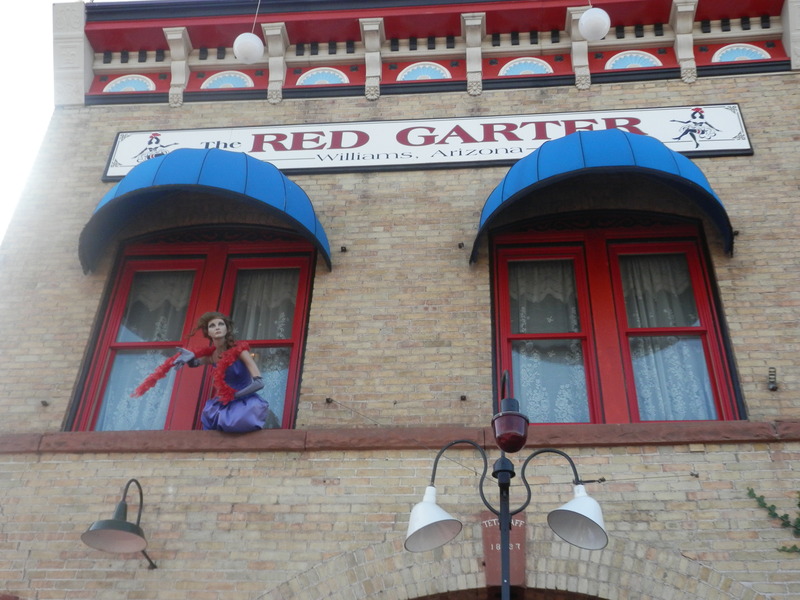 The nearby Red Garter Bed & Bakery retained outward hints of its former notoriety as a bordello. 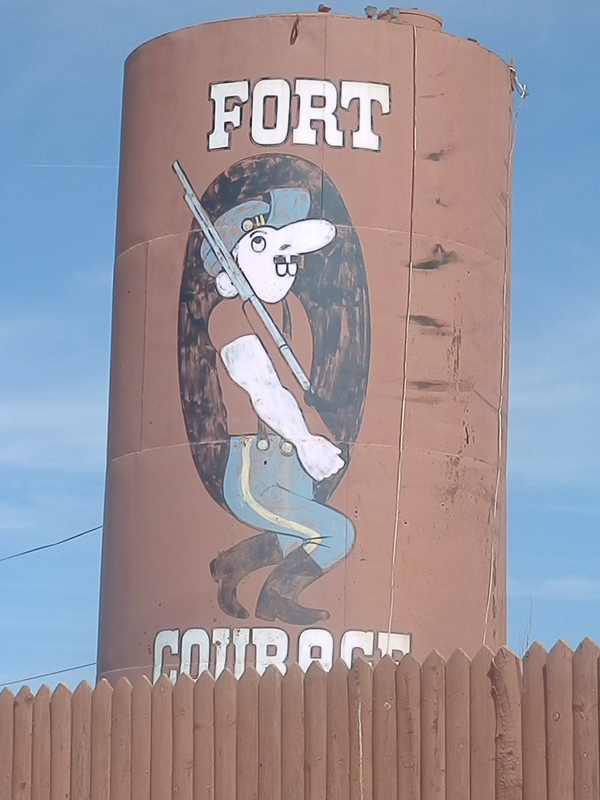 This town has the distressing or proud, depending on your point of view, distinction of being the last one to be bypassed by the interstate on 13th October 1984 when Bobby Troup, the writer of (Get Your Kicks on) Route 66 attended the closing ceremony. 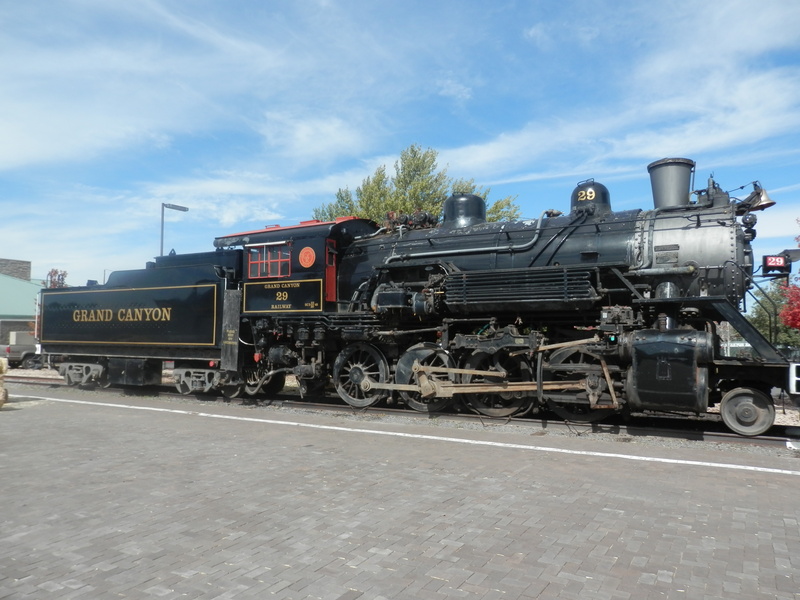 That might have proved the death knell of the community, but its railroad history and proximity to the Grand Canyon enabled it not only to survive but thrive as an important major tourist location. 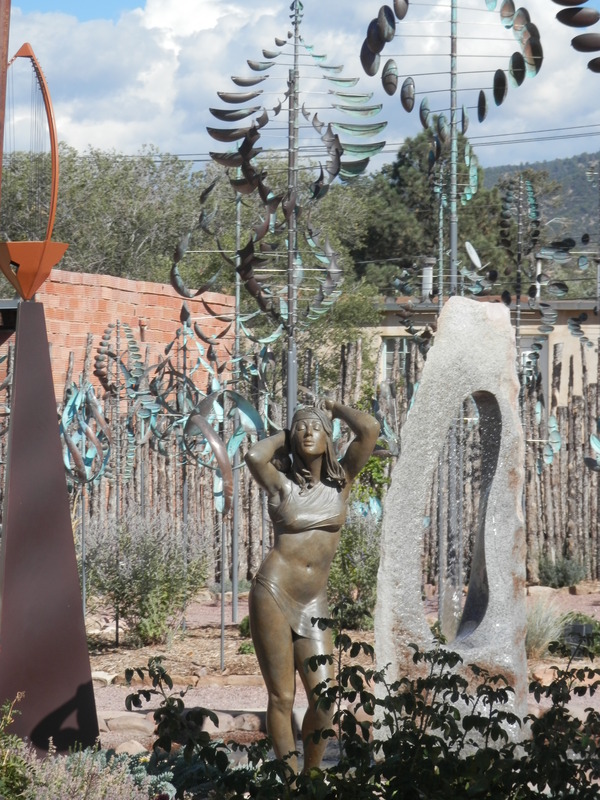 We were immediately attracted to Williams with its frontier feel and vibrant Route 66 connections. Nearly every establishment, whether a gift store, diner, trading post or motel, appeared to be selling a large selection of road memorabilia. We were spoilt for choice of dining options here too. Cruisers Café 66 Bar & Grill, which would have been my original preference, was, sadly, closed, though we were still able to roam its delightful patio with its vintage gas pumps (above), murals and and quirky Halloween paraphernalia (below). 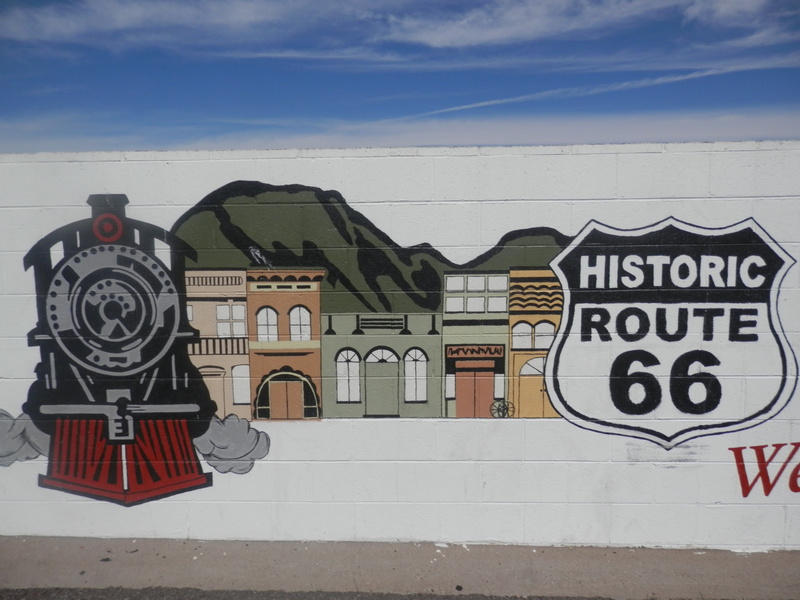 Of all the towns we had visited on our trek through New Mexico and Arizona on America’s Main Street, nowhere flaunted its Route 66 heritage more than Williams, as the restaurant sign below illustrates. And we loved it! Eventually we decided on breakfast at the Pine Country restaurant, a classic diner with friendly staff, family atmosphere and, of course, its own mini gift shop. 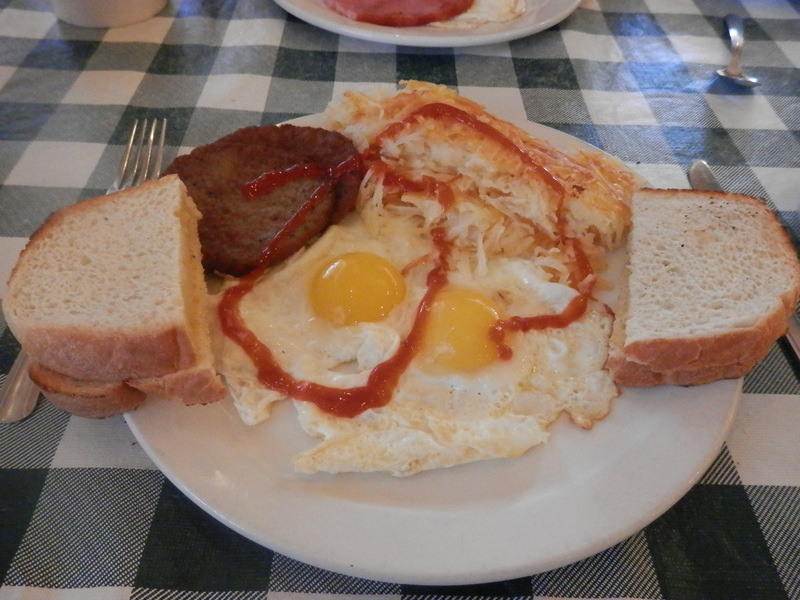 Two fried eggs sunny side up, hash browns, sausage patty, lashings of ketchup, sourdough bread and, of course, unlimited coffee, was just the right fuel for the long road ahead. 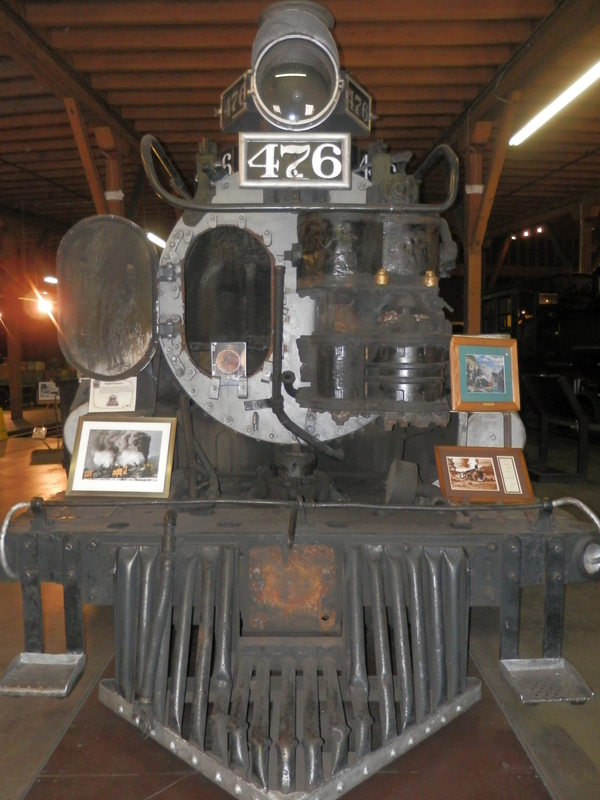 Aside from its Route 66 frisson, it is Williams’ railroad history that brings the visitors flocking in today. 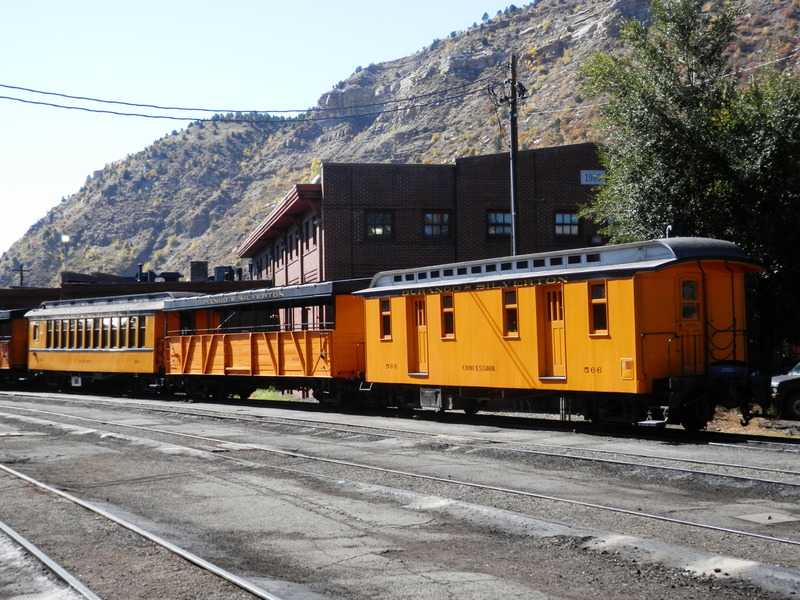 The Santa Fe Railroad first connected it with the Grand Canyon in 1901 but it went out of business sixty seven years later. 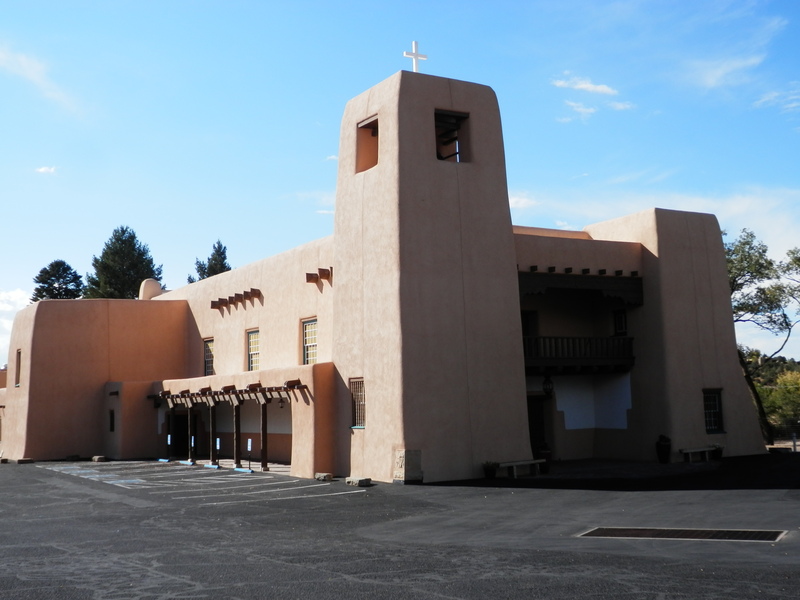 Then in 1989 it reopened as the embarcation point for the Grand Canyon Railway which now carries tourists the 65 miles daily to the South Rim through the high plains and pine forests. An essential excursion on our next trip. 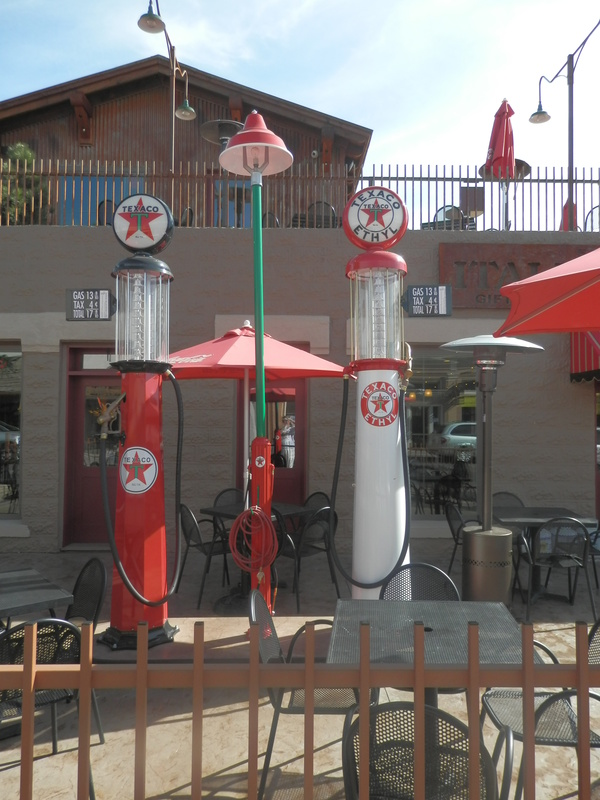 Another of the town’s nostalgic diners is Twisters, full of road memorabilia and complete with original fifties soda fountain and bar stools. The reasons for a return trip in the not too distant future mount up – only time today for a handful of photographs of the exterior. 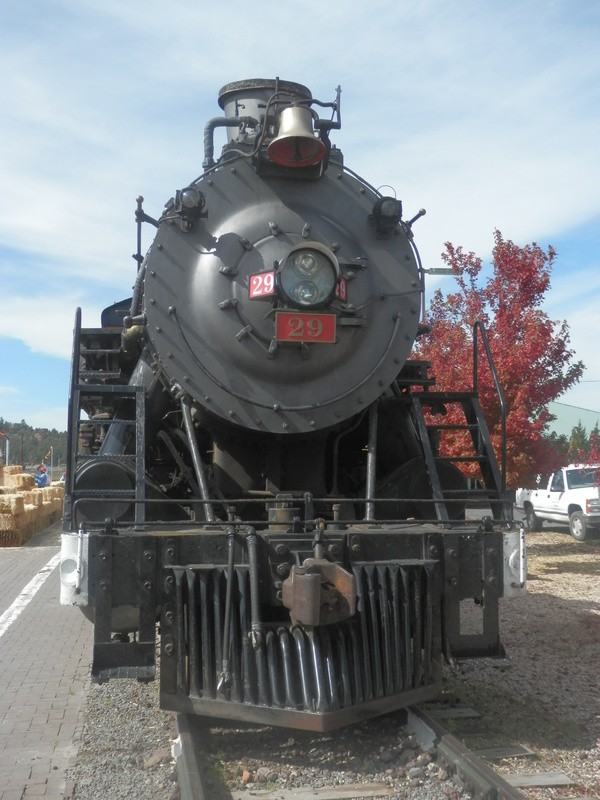 We would have loved to have spent longer in Williams (it was now nearly 11 o’clock), not least to explore the Arizona State Railroad Museum (and sample each of the diners! ), but were mindful that we needed to reach Vegas as early as possible in order to avoid a lengthy queue at hotel check-in. And there was that gig to get to. 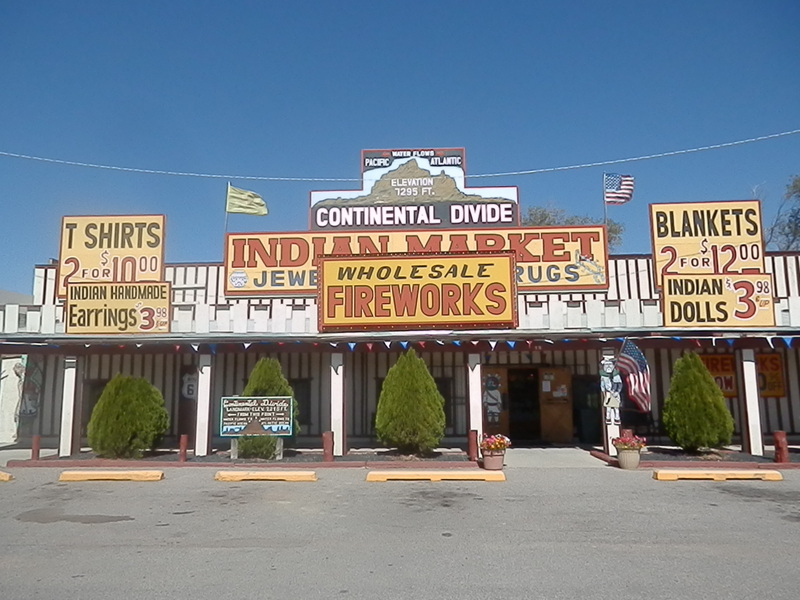 This meant we had to remain on the interstate rather than join the Route 66 loop which included Seligman and its legendary Sno-Cap Drive-In and the equally famous Hackberry General Store. I am so looking forward to that next trip! 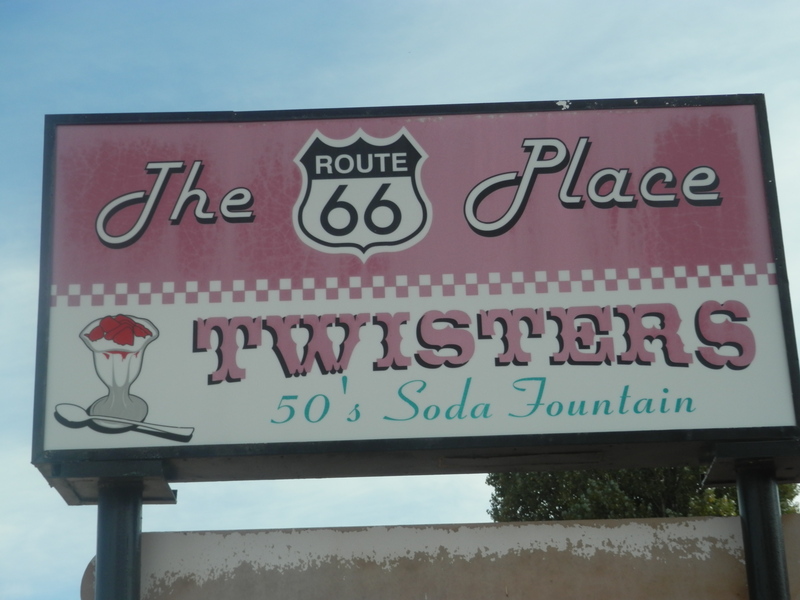 There are few things in life as alluring as a road trip, and few roads beckon as seductively as Route 66. 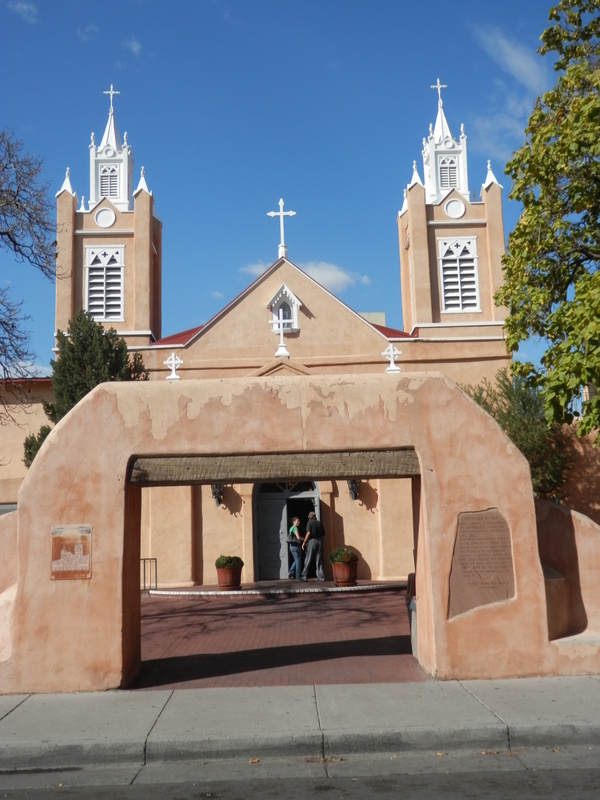 We may now have been concentrating on eating up the miles rather than looking for obscure Route 66 spots, but it did not dull our powers of observation. Hitchhikers dotted this stretch of the interstate, a reminder of a gentler time and one we had not seen at all on the trip heretofore. Perhaps they were Deadheads trying to get to the Dark Star Orchestra gig in Vegas! No tie-dye in evidence, so probably not. We passed a truck carrying an unusual “oversize load” – an aircraft wing! Blown tires strewed the road and hard shoulder. At exit 48 at Kingman (along with Barstow and San Bernadino, celebrated in the final line of Bobby Troup’s classic song), we finally left the I-40 (and Route 66) to join the I-68 West and, shortly afterwards, the I-93 North to Las Vegas. It was a quarter to one, eighty four degrees (twenty three degrees warmer than it had been when we left Flagstaff but still eight degrees cooler than when we arrived in Vegas). We had exactly one hundred miles to go. We took a comfort break in a gas station and discussed whether we needed to “top” the fuel up, concluding that we might just make it – which we did, endorsing the decision we had made at the beginning of the day). Billboards for the casinos in Vegas were already a regular roadside sight. Much of the I-93 was desert with occasional shacks the only habitation. Plots of five, ten and twenty acres were on sale, though the landscape was bare and unprepossessing. Within the hour we had passed the Hoover Dam and crossed into Nevada. 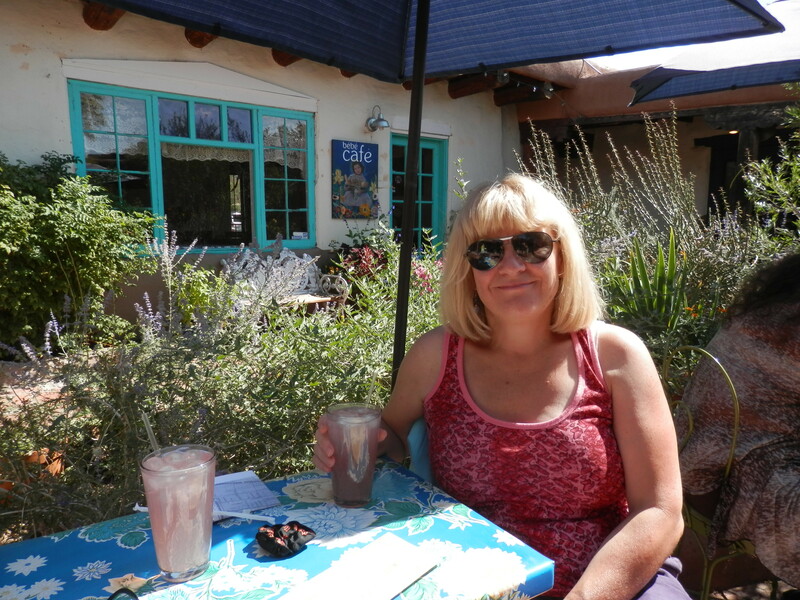 Having made such good time since Williams, we stopped in Henderson for an iced coffee before the final cruise into Vegas. Nothing in the past seventeen days had prepared us for the volume of traffic that greeted us on the run in to Vegas! We approached via Flamingo Road’s three lanes that seemed to go on forever, and made the right turn onto the Strip towards our hotel. 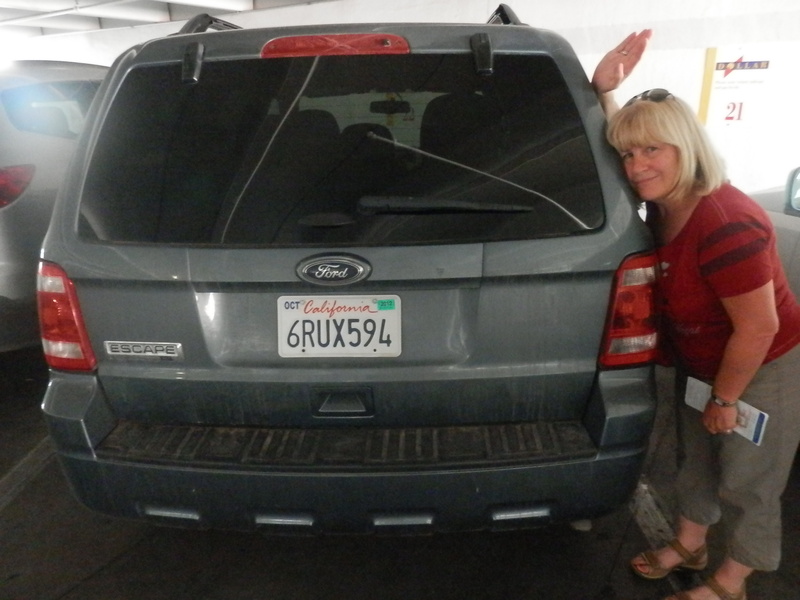 After a tearful goodbye to “Ruxy”, who had transported us, without a hitch, 2,325 miles across five states and innumerable extraplanetary vistas, we headed for check-in at Treasure Island. And yes, it was crammed! As the receptionist explained “half of Southern California is here this weekend” and most of them had just landed! But within the hour we were in our room overlooking the Strip. And not only did we make the gig but we arrived in sufficient time to eat in the House of Blues first – where it had all started two and a half weeks ago. 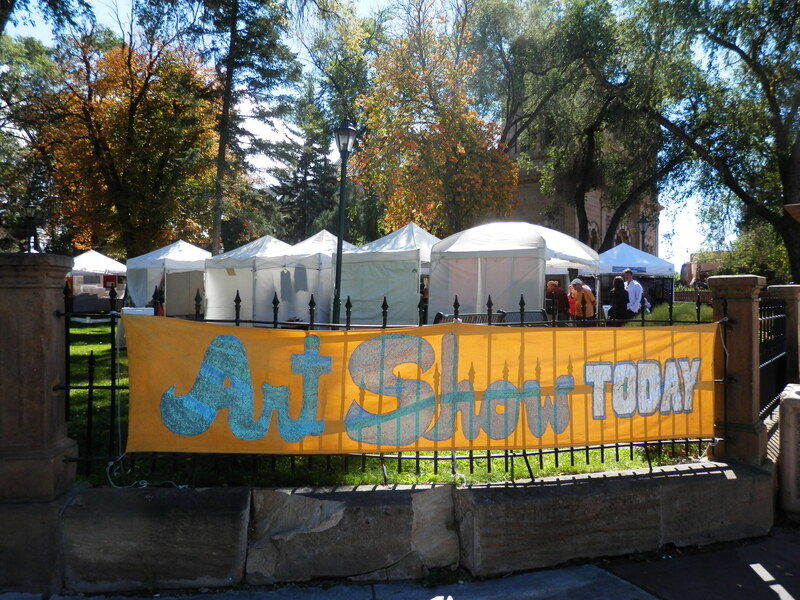 The concert was great – well I thought so! We walked the length of the Strip in the balmy early hours, and had a nightcap in the Breeze Bar in the casino before retiring. 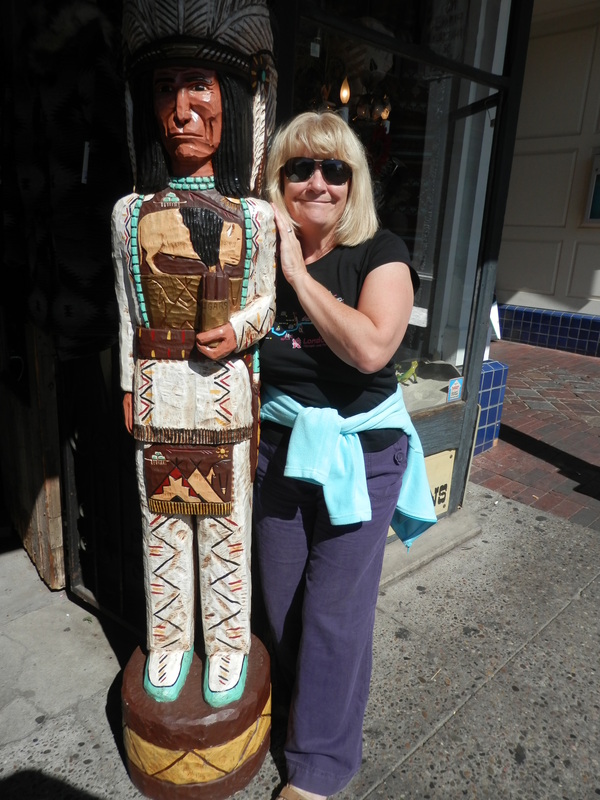 It was already my sixtieth birthday, and we now had a long weekend in Las Vegas to look forward to. As to what we got up to over the next four days – well, you know the phrase, don’t you? Fuelled (no pun intended) by coffee from the Armco gas station next door, we left the El Rancho Hotel in Gallup early, not only because the journey was 225 miles to Flagstaff where we were scheduled to stay for two nights, but because there were several notable attractions on Historic Route 66 that we were keen to explore. 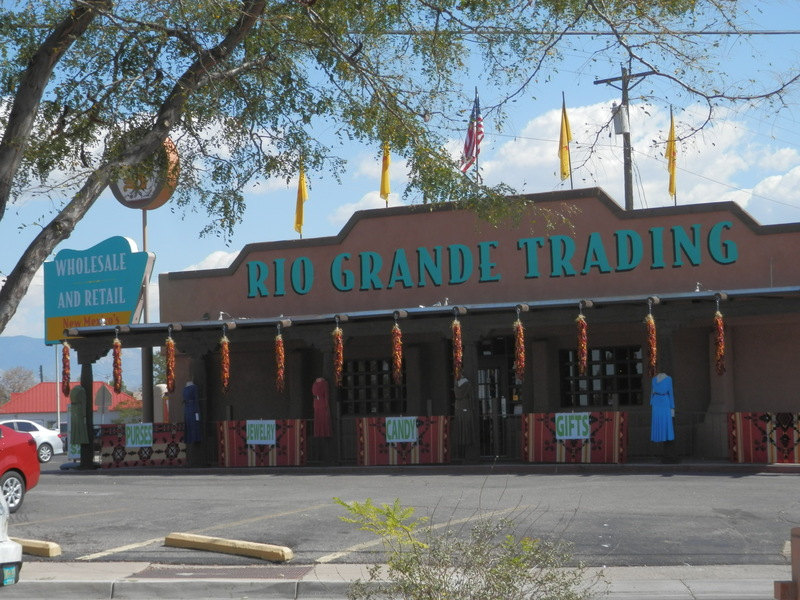 Although we had become accustomed to the frequency of stores selling Indian merchandise on the road, the profusion of trading posts on the outskirts of the town, including Richardson’s, Pow Wow’s and Ortega’s, reminded us that Gallup, home to members of the Navajo, Zuni and Hopi tribes, was the “Indian Capital of the World”. 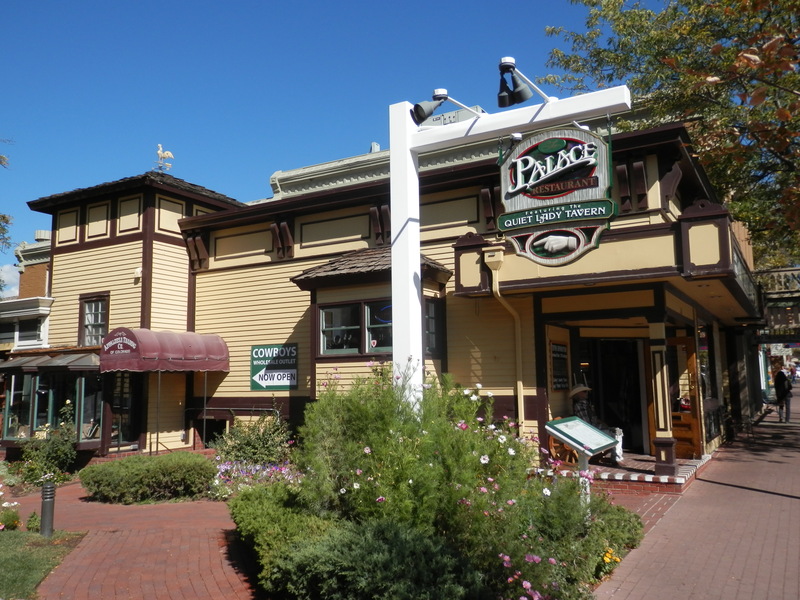 Our weakness for such establishments slowed our progress this morning, but we had the consolation of knowing that, on crossing into Arizona, we would be clawing back the hour that we had lost when we entered Utah for the first time a fortnight before. 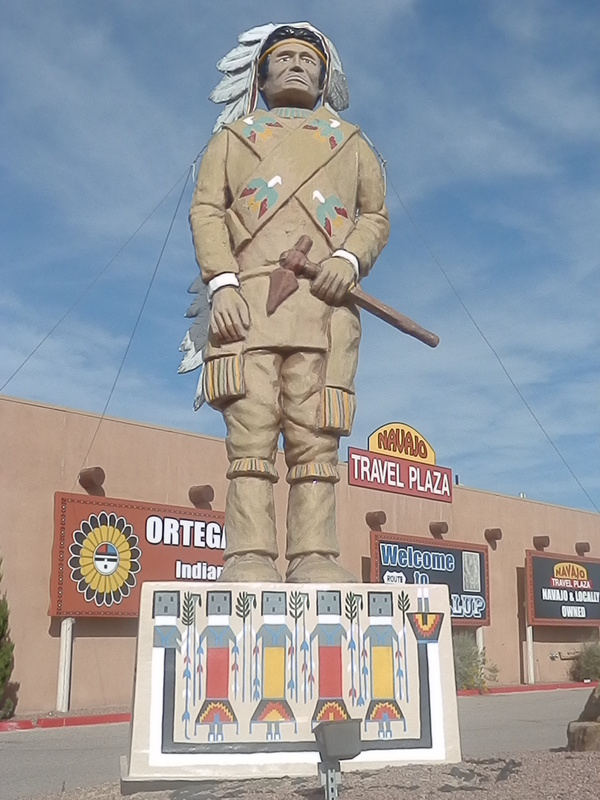 We plumped initially for the Navajo Travel Plaza, essentially an immense truck stop but one that we were lured to by the imposing Indian statue in the forecourt. On leaving the plaza we made two unplanned detours in an endeavour to get back onto the I-40W. The now ubiquitous Burlington North and Santa Fe Railroad trains snaked eastward alongside desert scrub where sheep scrabbled for scarce food. 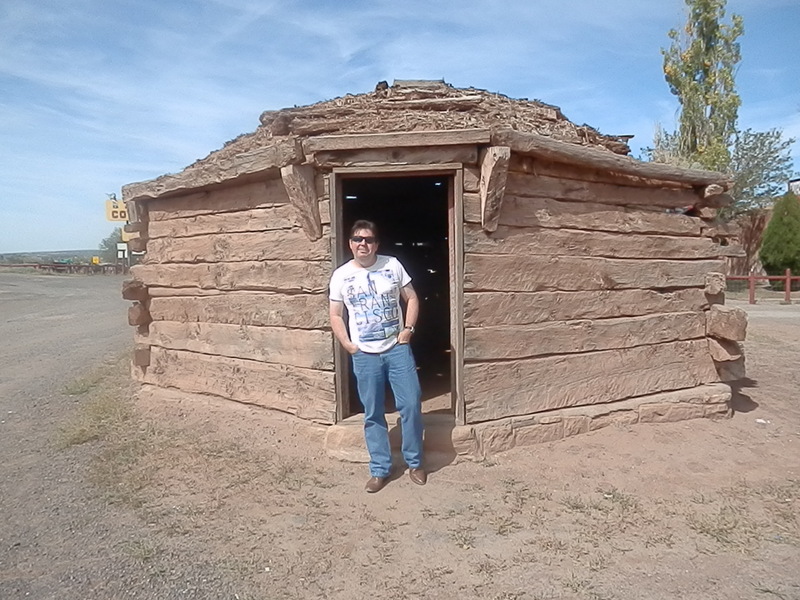 On re-entering the Navajo Nation once again, we stopped at the Chief Yellowhorse Trading Post near Lupton, a ramshackle collection of wooden buildings selling the usual Native American jewelry, rugs and other gifts. The most interesting part of the complex were the sheer cliffs that overhung it, where the owners had had large statues built of the animal species that frequented the area. 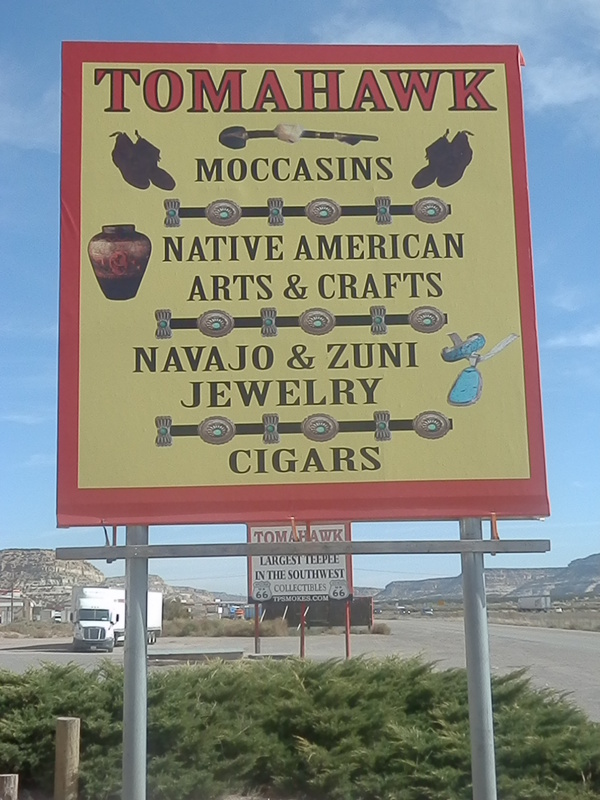 Further along was the Tomahawk Indian Store, housed in “the largest teepee in the southwest”. I cannot recall for certain whether we actually purchased anything here as a) we bought a lot of Indian jewelry on the trip, and b) the structures looked very much the same once you were inside. Tempted by its vigorous roadside publicity for the past few miles, we turned off the road next at Indian City near Houck. 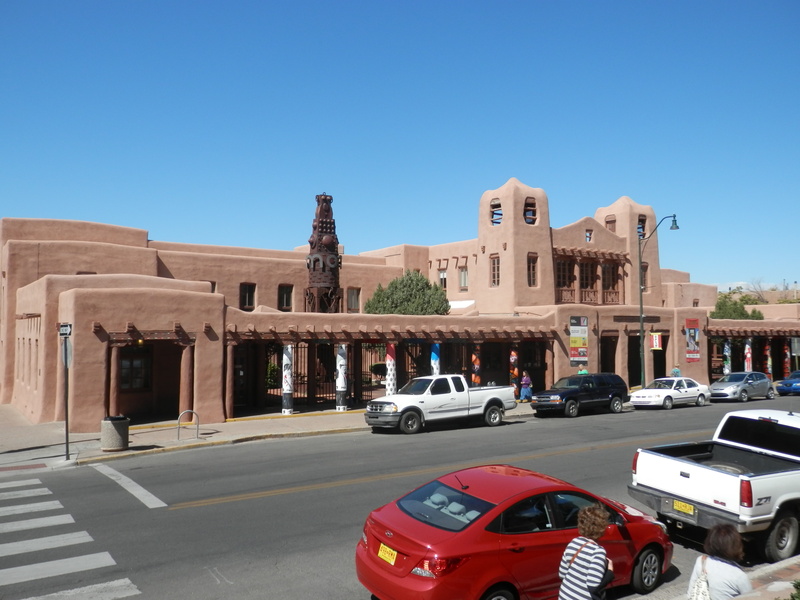 This comprised two distinct buildings – Chee’s Indian Store, once a Navajo rug stand, and the newer pueblo-style building called, strangely enough, Indian City. Despite the clean, modern look of the latter I preferred Chee’s, not least as I was able to purchase the beautiful Navajo by Susanne and Jake Page from its extensive bookshelves. I nearly contrived to leave it behind in the shop, however, as the woman at the counter, not having seen it before, wanted to read it first, gushing over the photographs and excitedly explaining to me that her mother still wore the same traditional clothes and jewelry as the women depicted in the book. 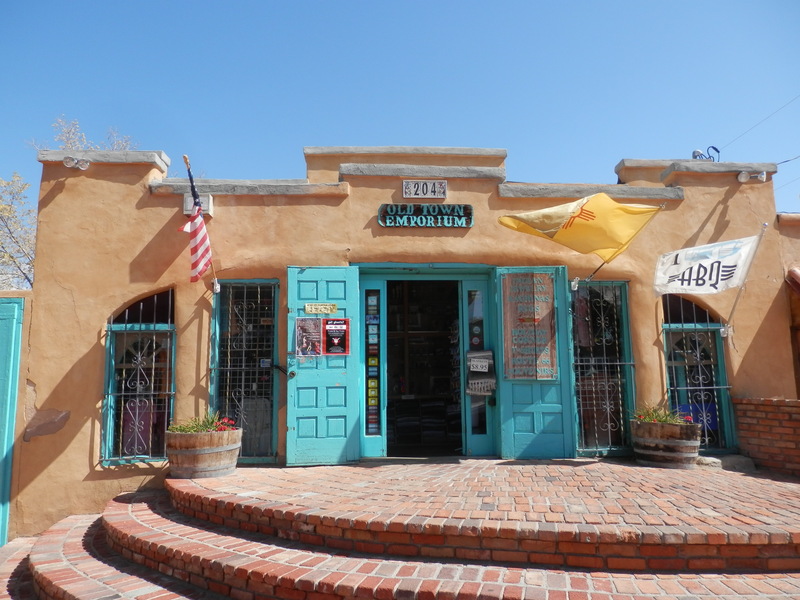 We continued to follow the frontage road which ran parallel to the I-40 for a number of miles before arriving at the Fort Courage Trading Post, another store attached to the rickety facade of a western fort. 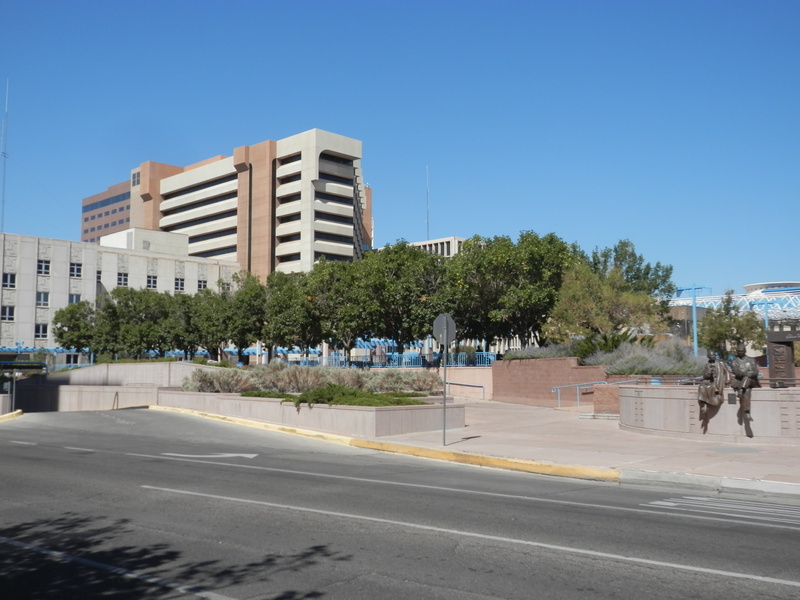 If any reader thinks the place looks familiar, it was the setting for the mid-late sixties TV sitcom, F Troop. Given that it was broadcast on the ITV network in the UK, I never saw it (my parents were BBC loyalists), but Janet was able to relate more to it. An abandoned gas station and adjoining windmill-shaped pancake house added a note of sadness to the whimsy. The reason I am standing outside the hogan in the photograph above has more to do with the prevailing stench inside than any decision to get the best light for the shot. Despite the welcome extra hour, we were not making as much progress as we might have liked. And with several stops still before us, we needed to recoup some time. Balanced against that, we were getting hungry. Our previously reliable supply of granola bars on the back seat of the car was dwindling and something more substantial was required. 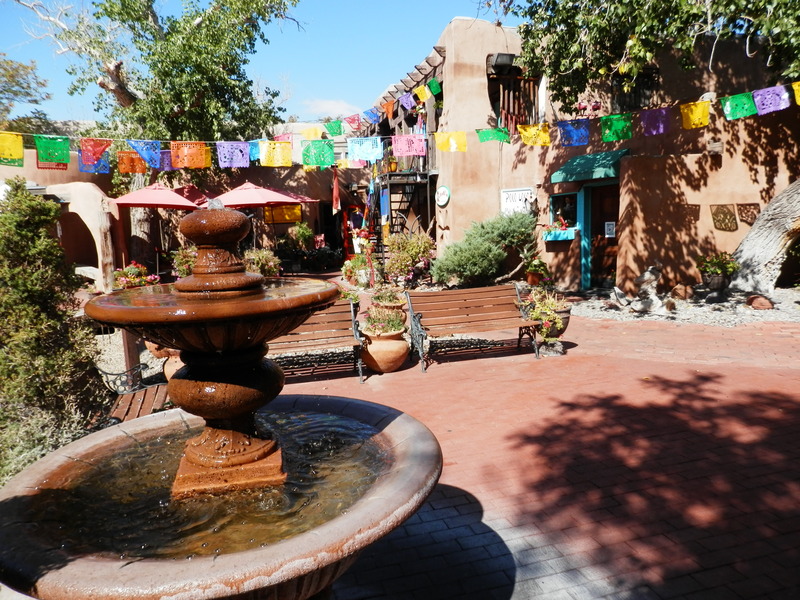 Our next scheduled “stops” were the Painted Desert and Petrified Forest, neither of which provided refreshment facilities beyond the usual gift store fare. 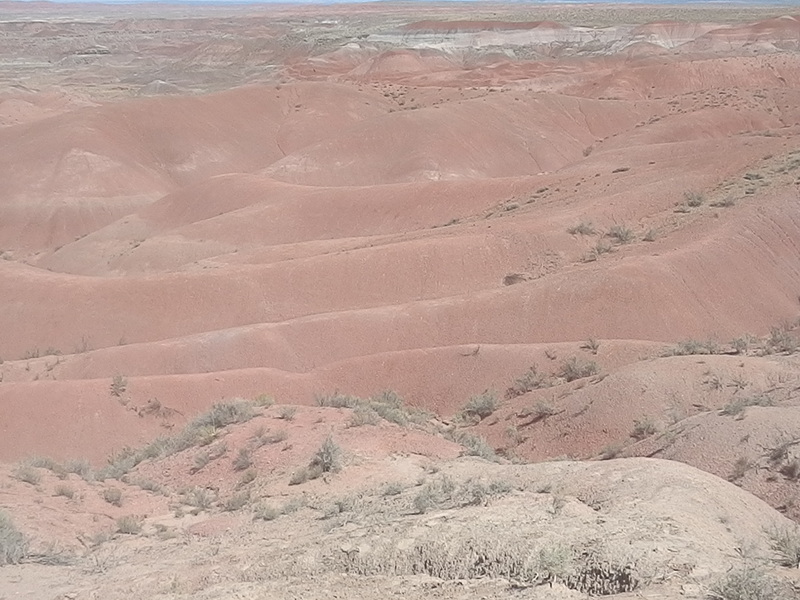 We parked and walked to several of the overlooks to survey the stunning colours of the former, but, reluctantly, did not give the Petrified Forest the time it deserved, driving through it without stopping. Had we done so, we would have had to alter the title of this post. 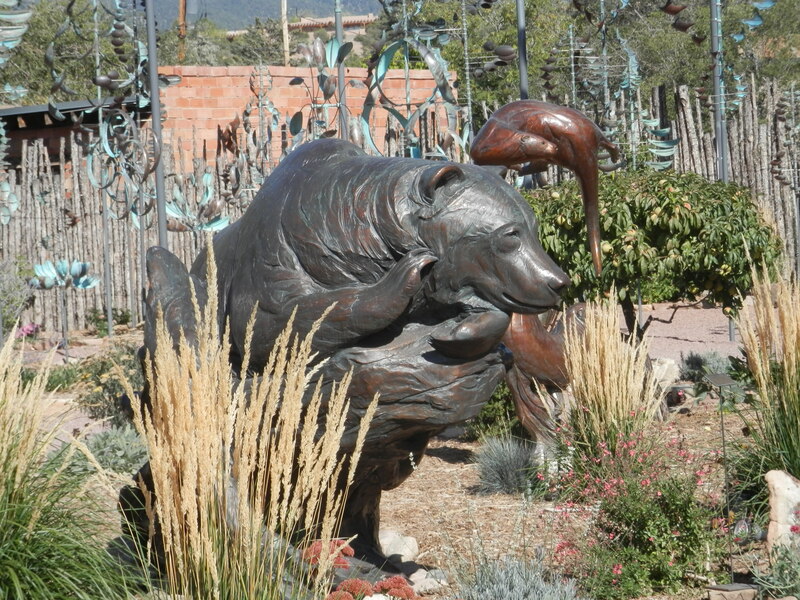 Holbrook, the halfway point on today’s route and natural lunch location, was reached via the gunbarrel straight I-180. 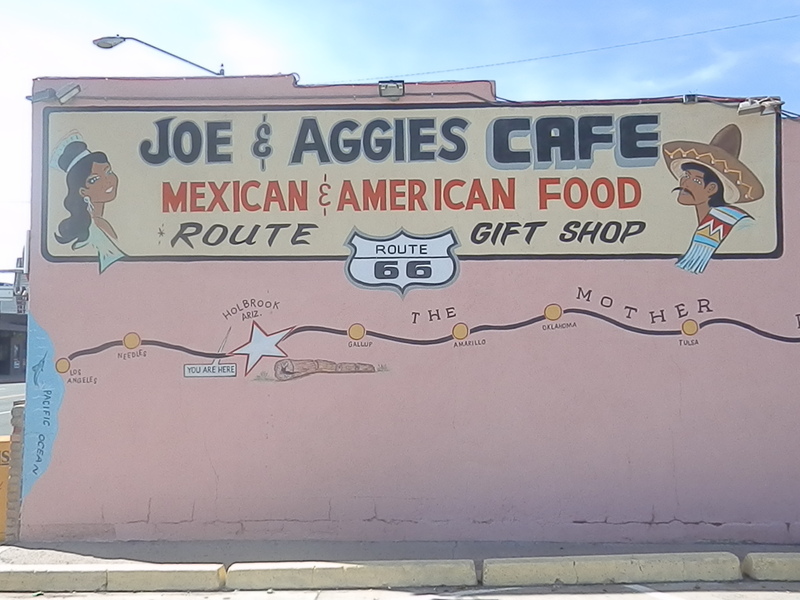 As we proceeded through a downtown that was not afraid to flaunt its Route 66 connections, we searched for one of the more fabled dining stops on this section of the road – Joe & Aggie’s Cafe. 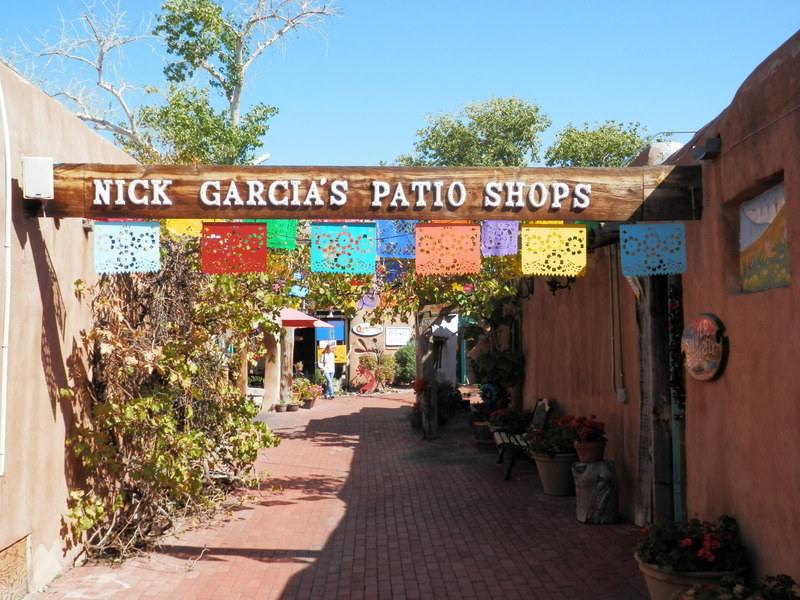 Aside from their blend of Mexican and American cuisine, the restaurant doubles up as a small museum displaying Route 66 memorabilia. 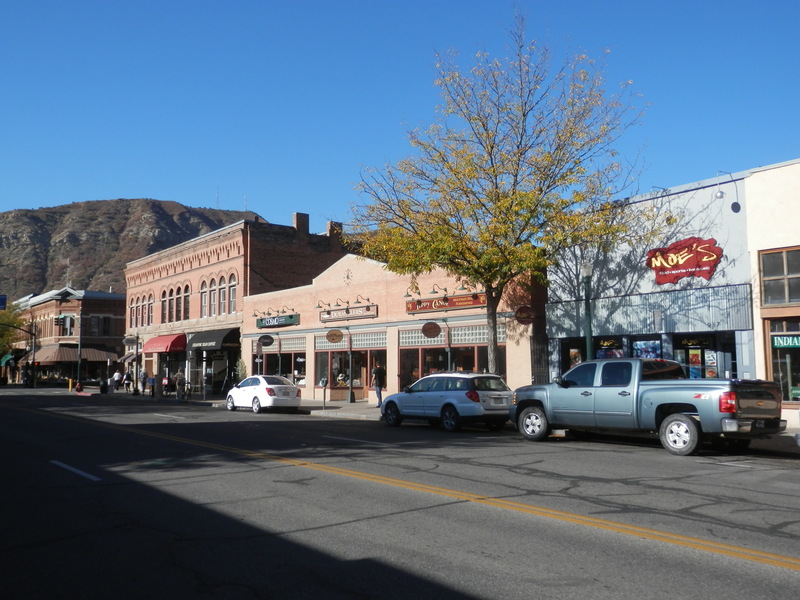 It also has an enviable place in movie history as the inspiration for the depiction of America’s Main Street in the Pixar film, Cars. Waiting for our sandwich orders, we had no choice but to listen to an elderly regular proclaiming his pride at receiving his new hearing aid. A pair of bikers at the next table argued about their next move as they shuffled maps around. Service was friendly and efficient, although the sandwiches did not quite live up to our expectations. We were not permitted to leave the establishment without signing the visitors’ book. 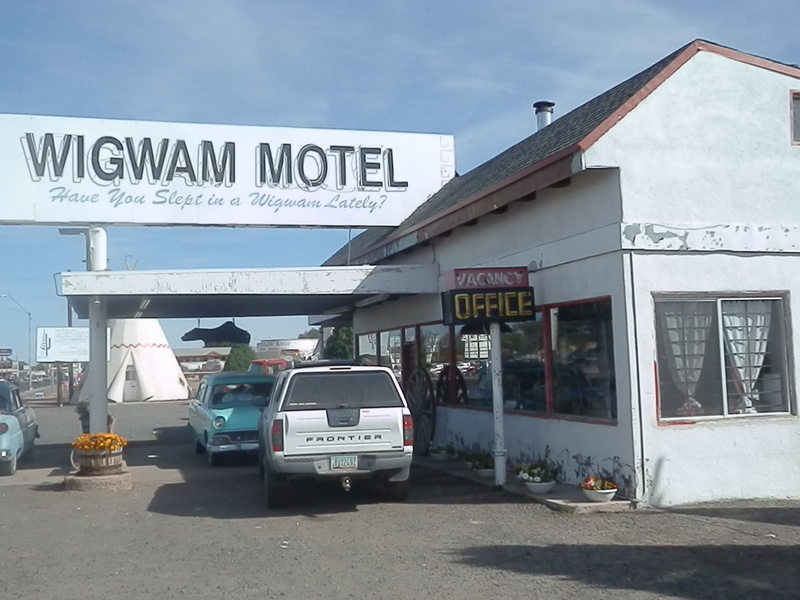 With the temperature nearing ninety degrees, it was a very short drive to the next iconic sight on today’s list – the Wigwam Motel. 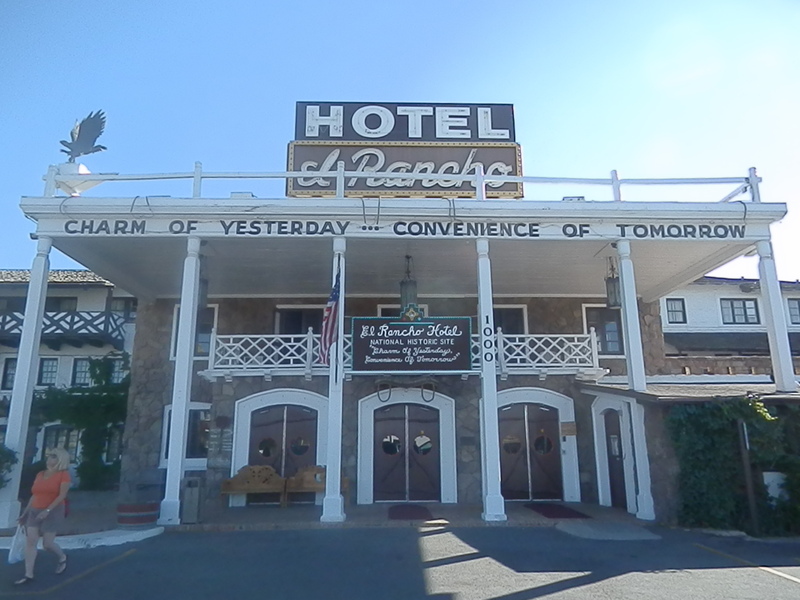 Once there were similar lodgings all along The Mother Road but only two remain today, the other in Rialto, California. 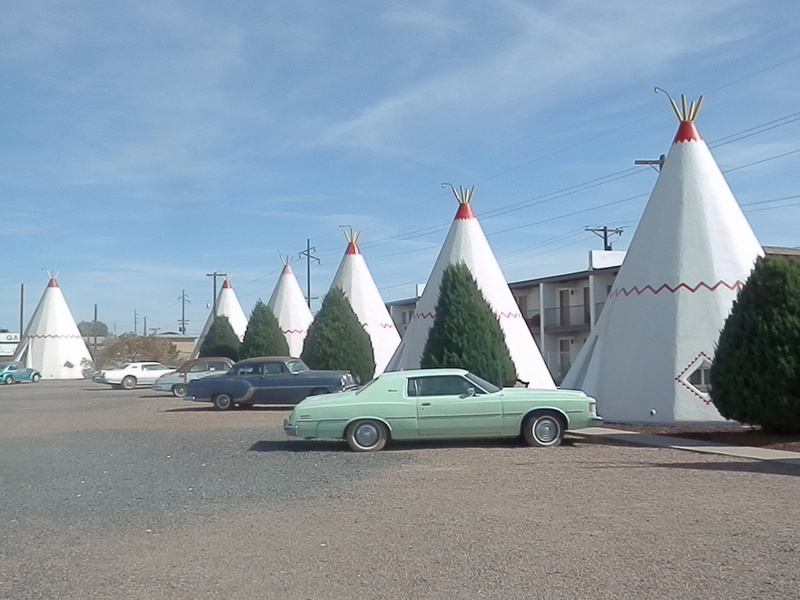 With its marketing slogan of “Have You Slept in a Wigwam Lately?”, the motel continues to thrive as both a novel lodging option and an open air museum that parades vintage cars outside each “unit”. Attractive though the 32 feet high “rooms” look from the outside, I doubt I would wish to spend more than a single night in one, and that only for the novelty value. 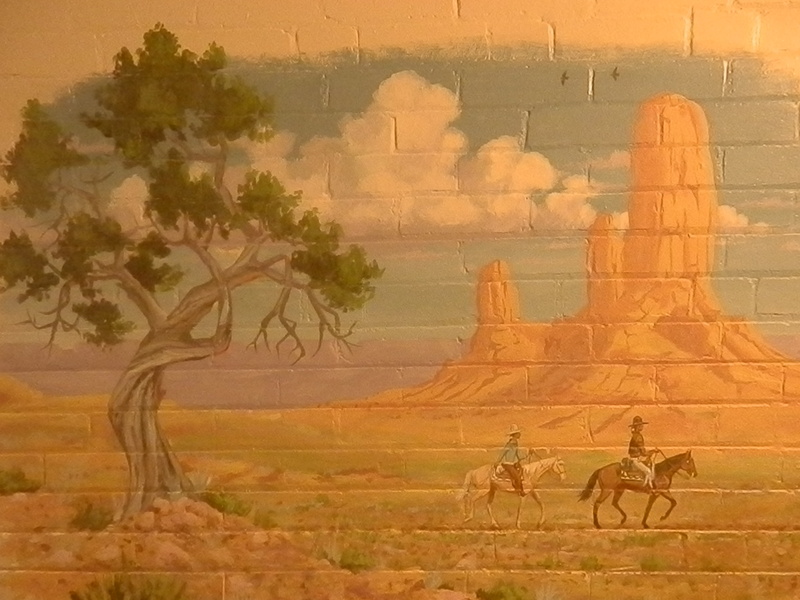 But would I choose the El Rancho Hotel in Gallup over this? I suspect not. On woefully short acquaintance, Holbrook joined the growing list of towns that we would have welcomed the chance to explore further. But not on this trip. For a brief moment I think Janet thought seriously of exchanging our house and car for the alternatives on display below. The procession of bizarre attractions just kept on coming. 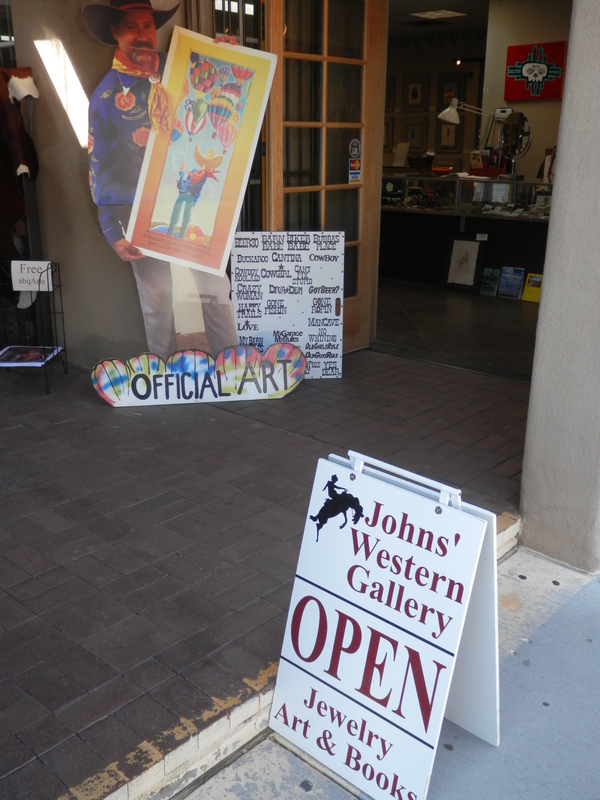 Next stop was the Jackrabbit Trading Post in Joseph City. 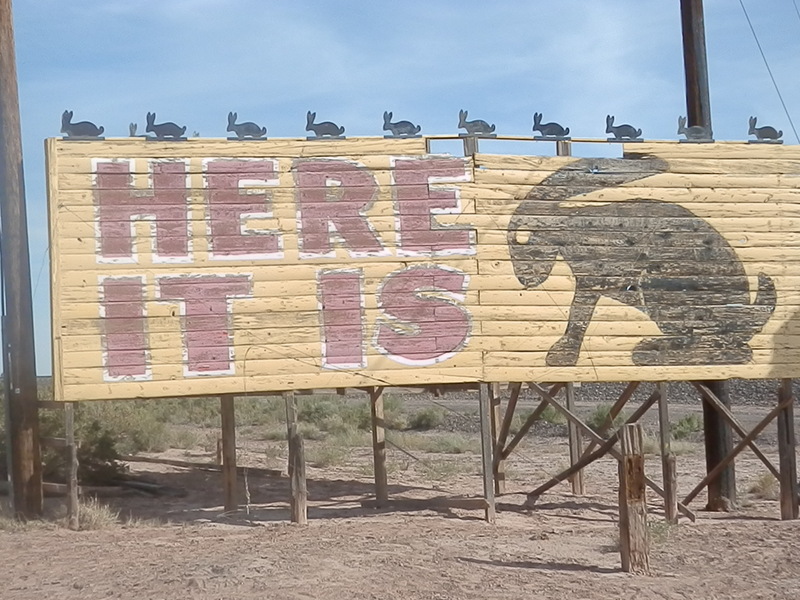 The billboard declaring “Here It Is” is celebrated as one of the most iconic signs on the entirety of Route 66. In the road’s heyday of the post war years, motorists approaching from all directions were forewarned by a succession of yellow and black signs with a crouching rabbit counting down the miles. There may be fewer now, but the sense of anticipation remains. 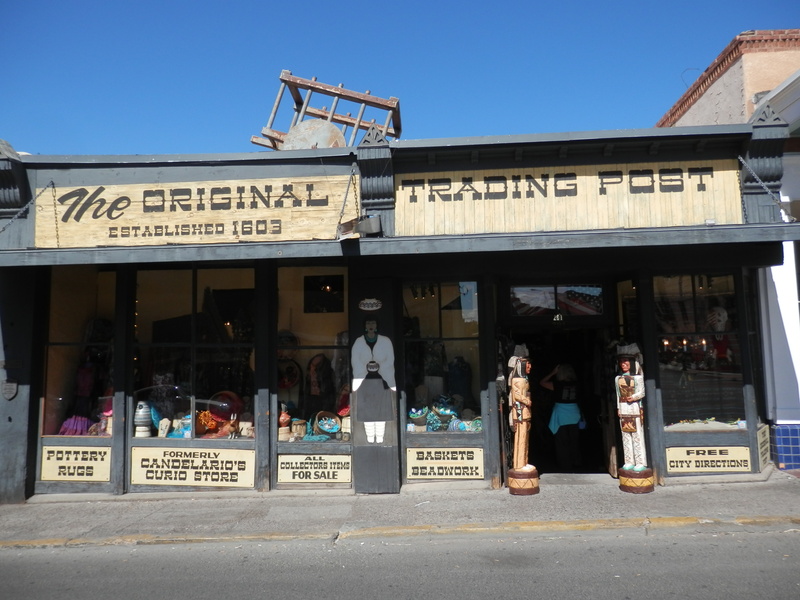 I doubt we were alone, however, in being disappointed at the failure of the reality, in the form of the average trading post, to live up to the hype. 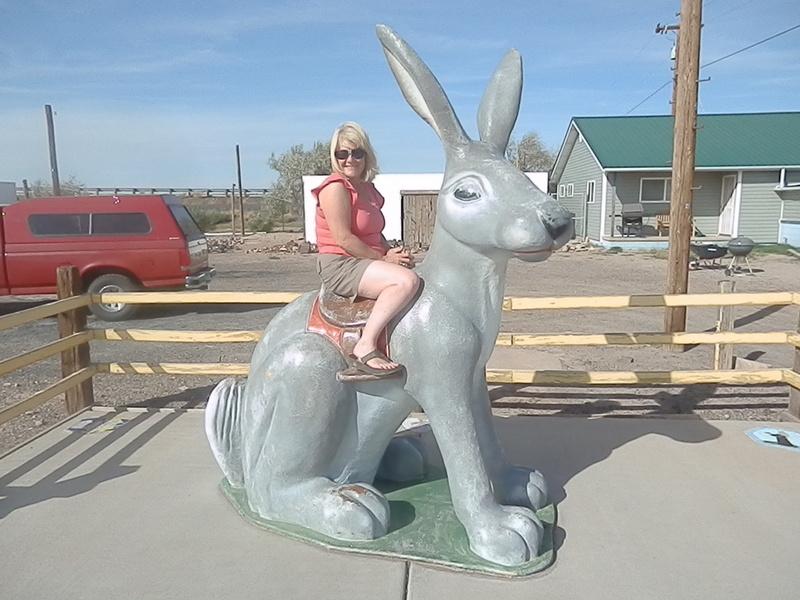 Nonetheless, Janet enjoyed her ride on the giant fibreglass statue in the parking lot – another of those “well, you just have to do it, don’t you?” moments (I didn’t by the way). 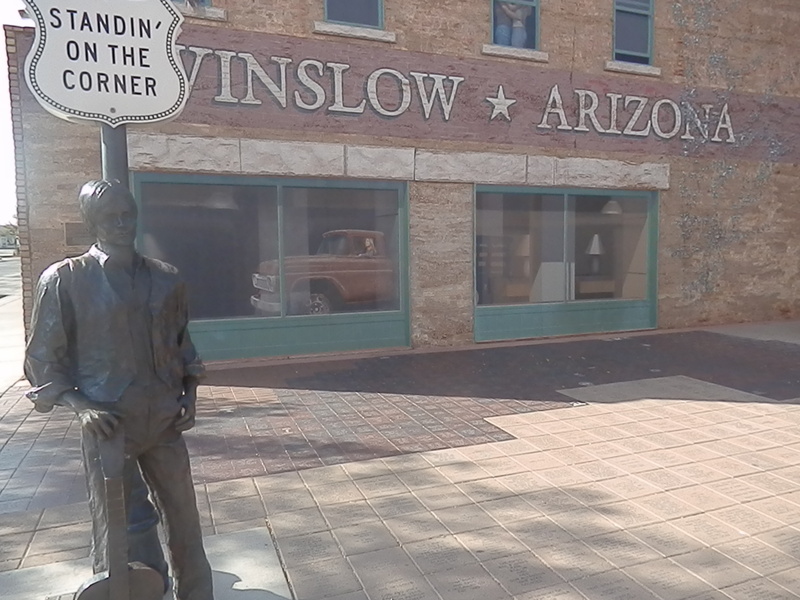 The last prominent town before Flagstaff on Route 66 is Winslow, Arizona, a name that resonates with any self-respecting hippie of the late sixties and seventies. Singer-songwriter Jackson Browne co-wrote with Glenn Frey the song, Take It Easy, which was the first track on the Eagles’ platinum debut album in 1972. The good burghers of Winslow seized on the marketing opportunity afforded by the song and erected a monument on the northwest corner of Second Street and Kinsley Avenue. It is now a place of pilgrimage for rock fans from all over the world, bringing renewed revenue and profile to the town. Whilst we leant against the figure, a young man on business from Baltimore, swung by and offered to take our photograph. 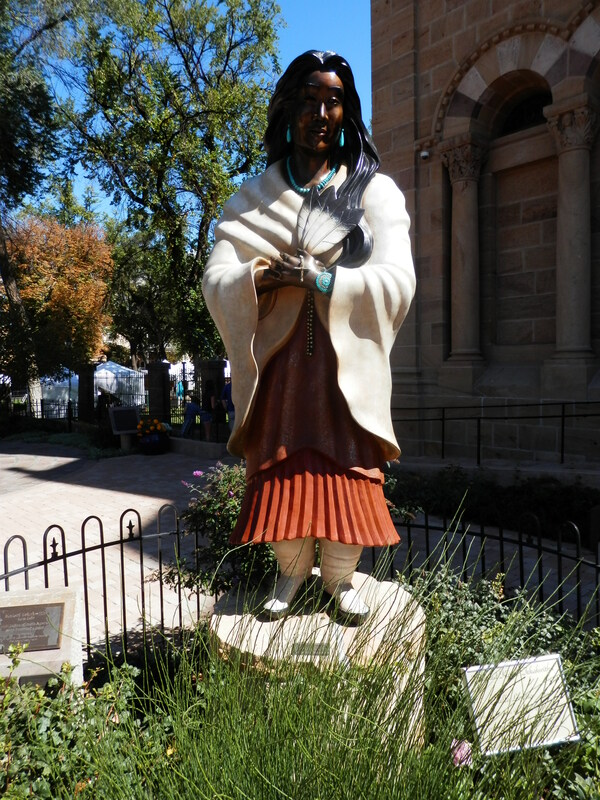 The girl, by the way, in the flatbed Ford, can be seen in the window behind the statue, which does bear a striking resemblance to a young Jackson Browne. 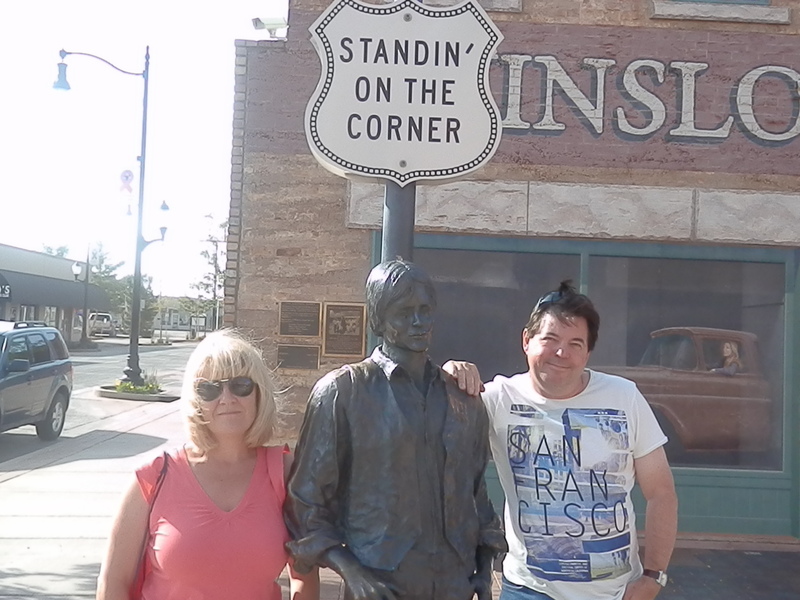 An excellent gift store selling a large amount of “Standin’ on the Corner” merchandise sits directly opposite the statue. 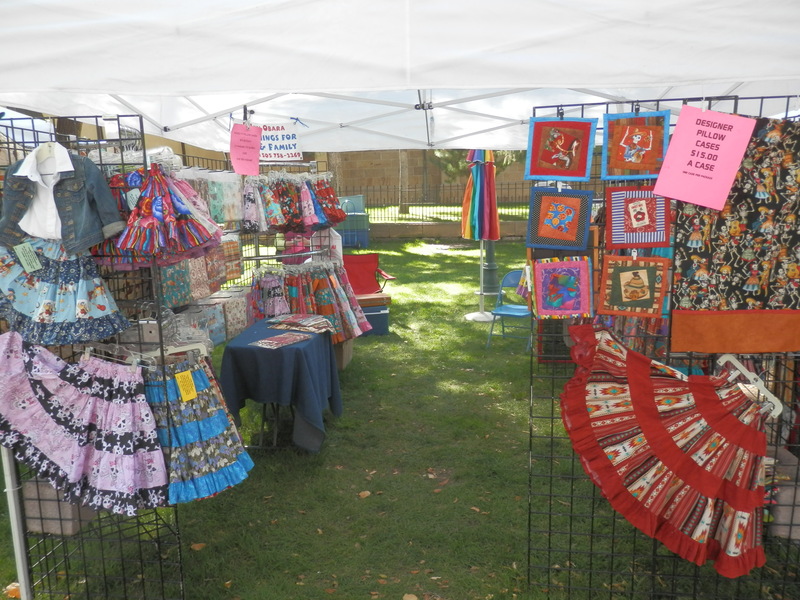 As we perused the t-shirts (yes, I bought two), mugs, fridge magnets, postcards, CDs and miscellaneous items, Eagles DVDs were being shown on the large TV screen overhead. Incongruously, the store was “manned” by two ladies of mature years who could not have given a better impression of disliking their job if they had tried. Not only did they fail to acknowledge the music (perhaps they had become immune to it), but they also made no effort to engage us in conversation, either about our purchases or our reason for visiting. It is rare not to be asked “where are you folks from” at least. 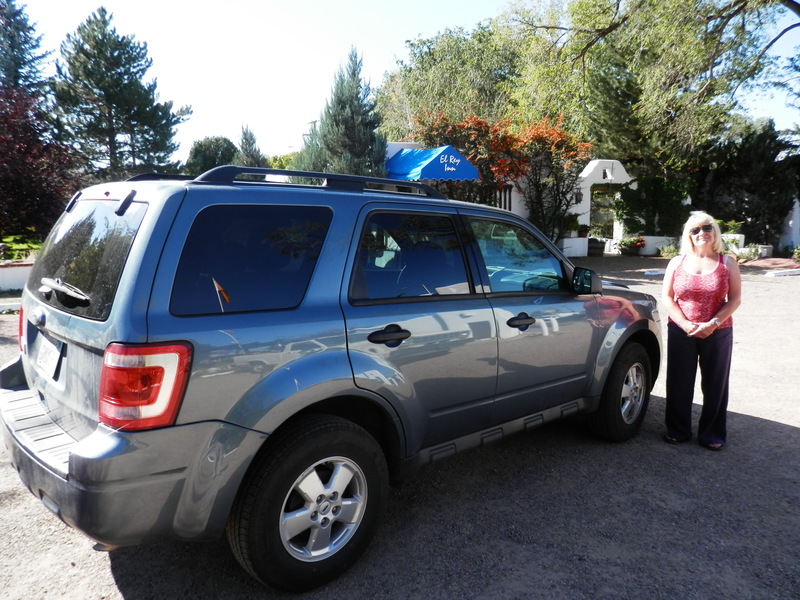 Anxious to get to Flagstaff before dark we gave Meteor Crater a miss and pushed on. 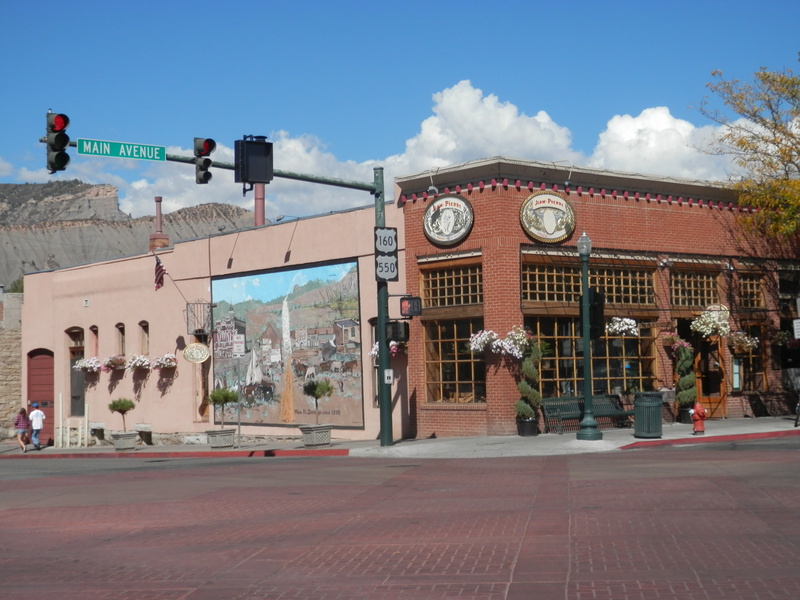 But not without attempting to visit one final location.Bobby Troup’s classic song, (Get Your Kicks) on Route 66, has the line “Flagstaff Arizona, Don’t forget Winona”. We didn’t, Bobby. Unfortunately, however, we couldn’t find it! 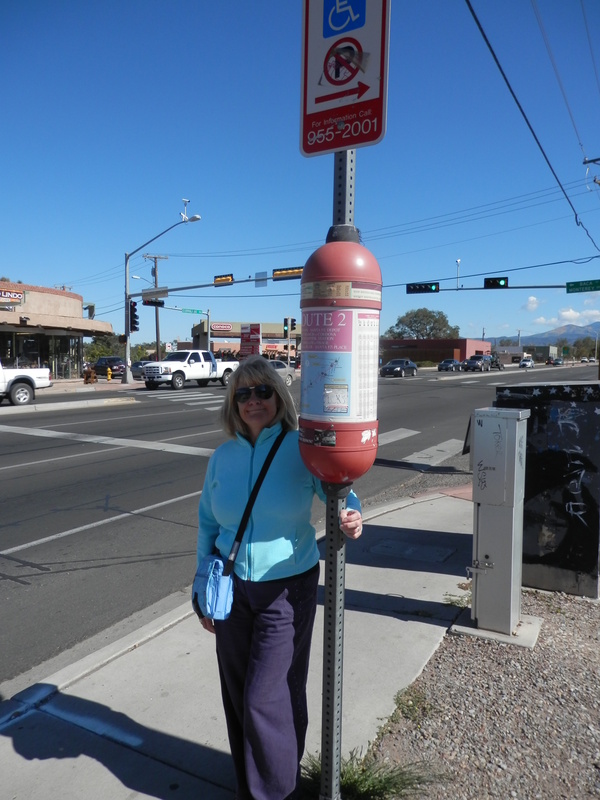 We took the advice of Roger Naylor, whose beautiful book, Arizona Kicks on Route 66, had been our primary guide, and took exit 211 on I-40, picking up the original Route 66 alignment, Townsend-Winona. 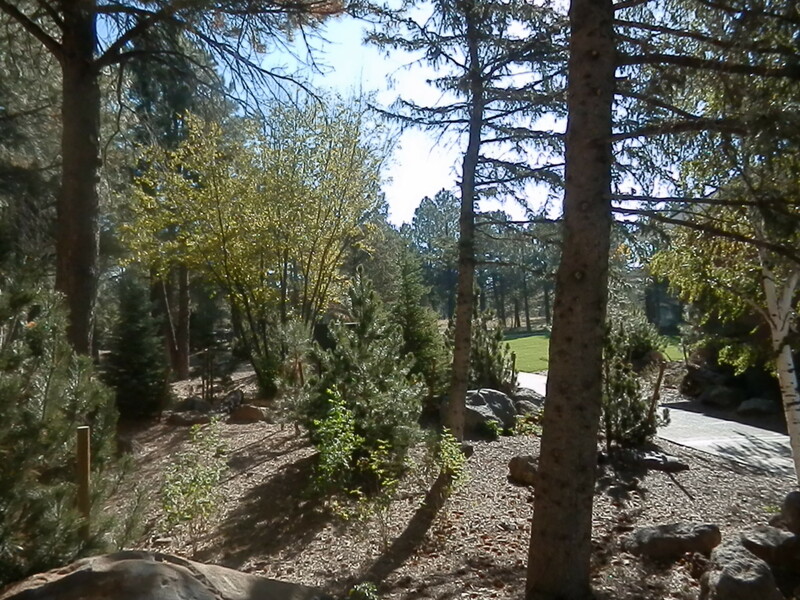 The scenery – Ponderosa pine woods, farms and meadows – was lovely, but, somehow, we failed to locate the town. Or perhaps we did and we didn’t realise it. This late afternoon detour meant we had deviated from our planned itinerary for the day. We were now approaching Flagstaff from the north on I-89 rather than from the east on I-40. After much map rustling and an increasingly fraught exchange of views as dusk descended on the edge of town, we succeeded in spotting the Little America Hotel on East Butler Avenue, sat alongside the entrance to I-40 West (and Route 66) in the direction of Los Angeles – very convenient for our getaway the morning after next. 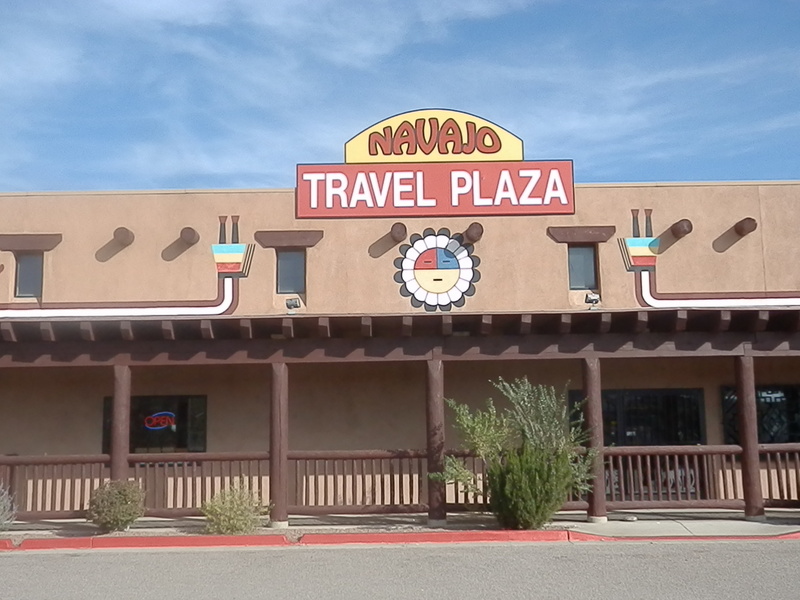 After our dark, cramped accommodation in Gallup we instantly brightened at the gleaming, welcoming lobby. 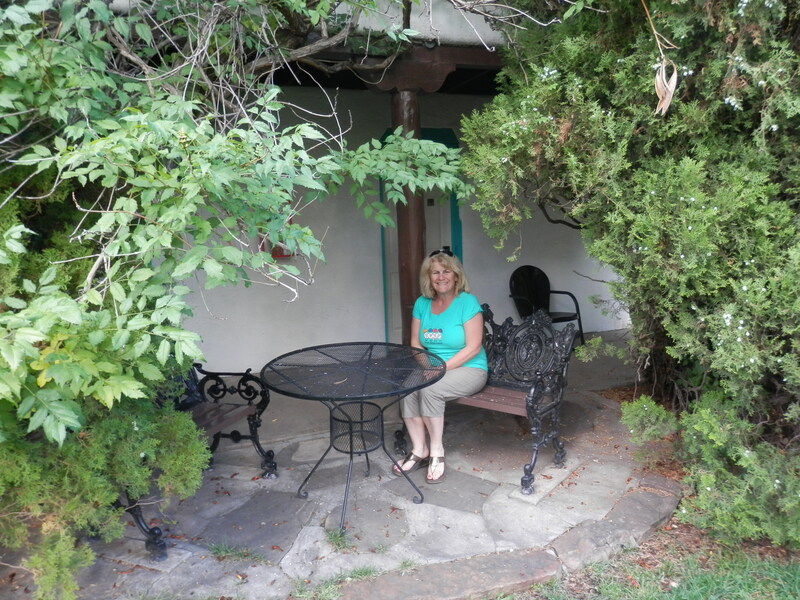 The hotel consisted of a number of interconnected buildings and we needed to drive through the parking lot for several hundred yards before reaching ours in a lovely, forested setting. Janet did not hesitate in taking advantage of the outdoor heated swimming pool whilst I acquainted myself with a room that resembled a suite. I write this piece on the morning after Barack Obama has been re-elected President of the United States (and I have had barely an hour’s sleep). That seemed a distant prospect as I watched in disbelief his lacklustre performance in the first presidential debate with Mitt Romney on CNN. My spirits were raised by the excellent dinner and highly attentive service in the elegant hotel restaurant that followed. It was a few short steps from there to the adjoining bar where we topped up our bottle of Pinot Grigio with a couple of Jack Daniel’s and gin and tonics respectively whilst engaging in a fascinating conversation about the road with a trucker from St. Louis, Missouri. He was en route to Los Angeles, a regular trip in which he covered between 600 and 800 miles a day, a figure we had difficulty in relating to (the shortest route using classified roads between Land’s End and John O’Groats is 874 miles). Today had been one of the most eagerly awaited legs of the trip, and whilst we had not managed to visit every attraction we had planned, it had not disappointed. 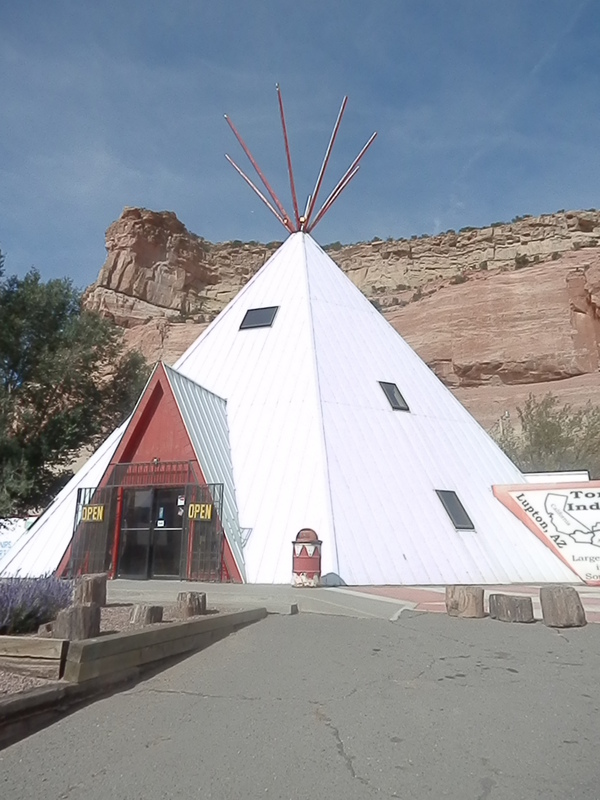 Trading posts, a roadside diner, a hotel comprised of wigwams, sitting on a giant jackrabbit, reliving a great pop lyric – we had done them all whilst progressing 225 miles west. The weather, as it almost always appeared to be on the trip, had been lovely. 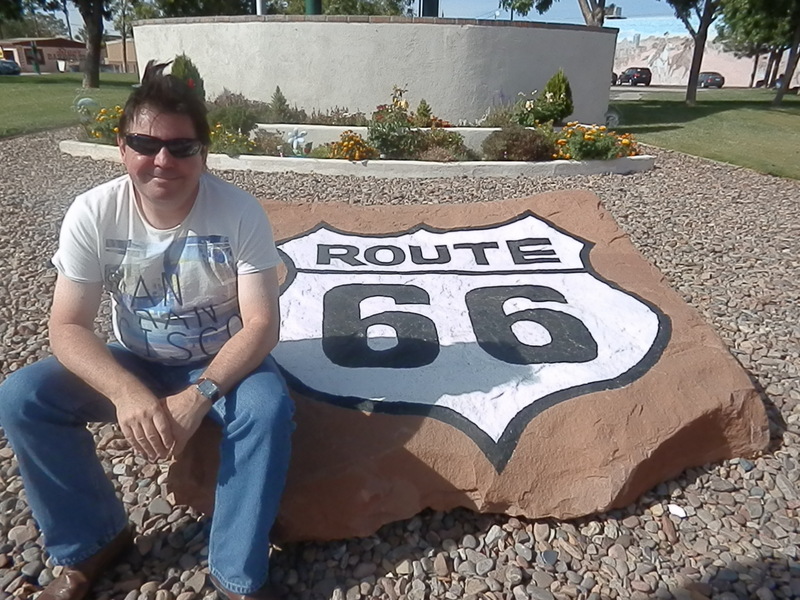 We were now genuine Route 66 groupees. But we had to wait another day for the chance to enjoy it further for tomorrow was “the big one”! 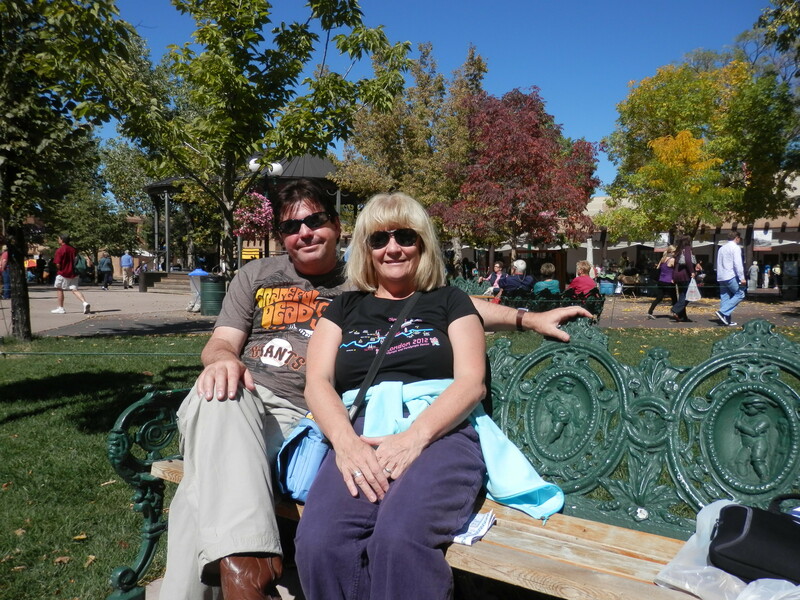 Today was the first of a four day drive back to our starting point in Las Vegas. 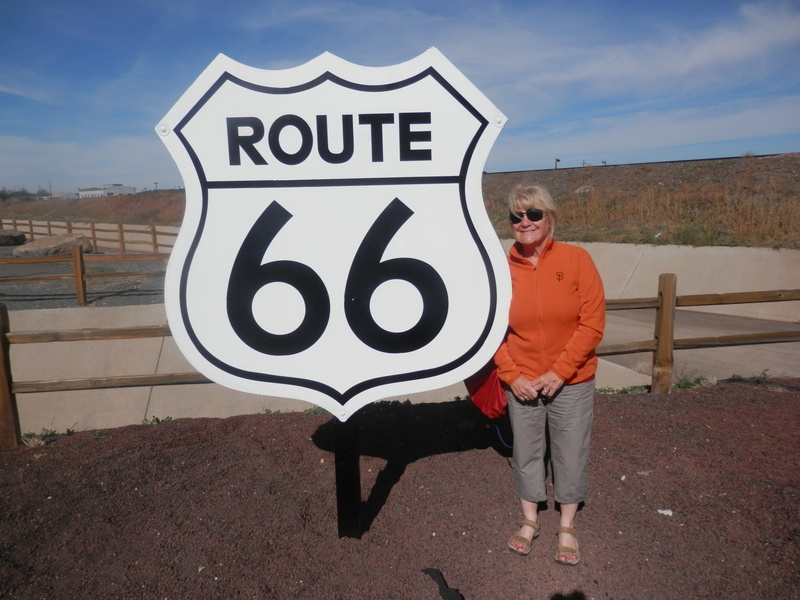 Much of that journey would be on, or close to, Historic Route 66. Excited at the prospect, we left Albuquerque on I-40 west. 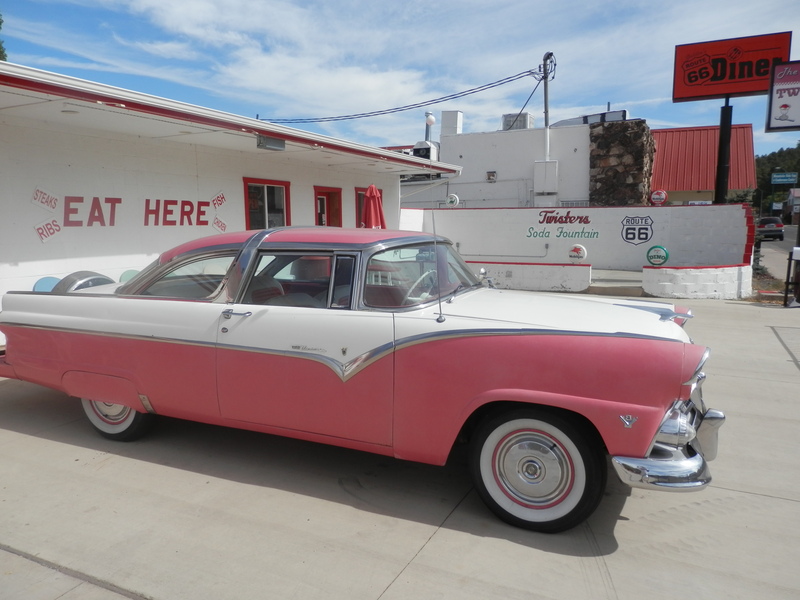 We had contemplated heading east initially to sample breakfast in the famous 66 Diner, but decided to press on – besides there would be other worthwhile sights to see before we arrived in Gallup (“Indian Jewelry Capital of the World”) for our overnight stop. The first priority was to fill the car, which we did at the 66 Pit Stop. Although we had not eaten, we could not be tempted at such an early hour by the “world famous” burger that was a speciality here. 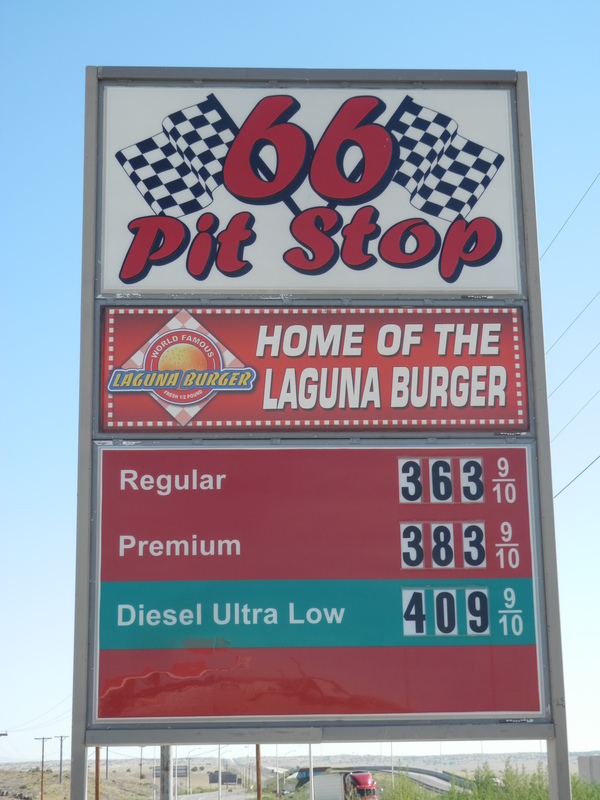 A short while later we drove through Laguna, the self-styled “New Home of the Laguna Burger”, which appeared to reinforce our earlier decision not to risk the “old” one back at the gas station. 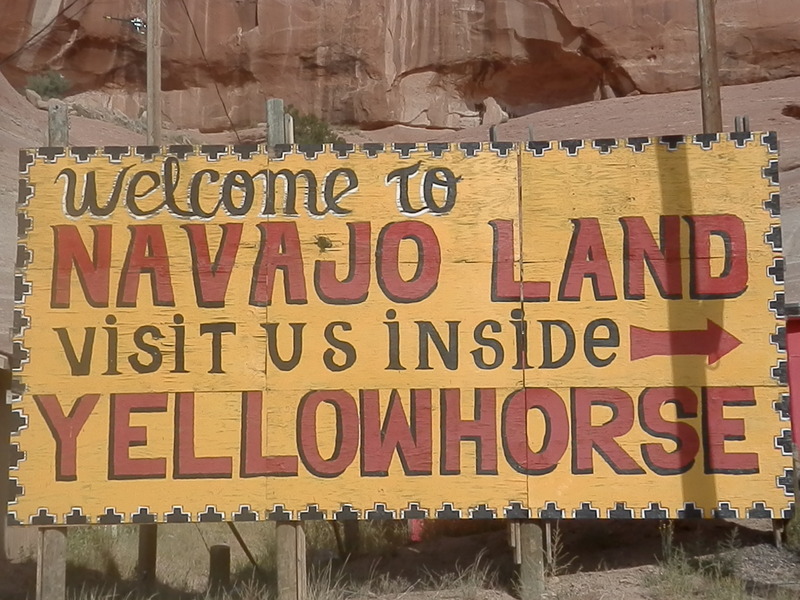 The Navajo and Laguna reservations hugged us on either side of the road as we looked for opportunities to slip off the interstate and test the four wheel drive credentials of the car on the often rough road that passed for America’s Main Street. It did not take long for us to skirt our first dead animal of the day – a calf shortly before the exit for Hajillee. At Grants – the midpoint and principal town on today’s journey – we came across, or at least acknowledged for the first time, a phenomenon that was to thrill, fascinate and haunt us in equal measure for the next three days – the sight of cargo trains of centipede proportions, motored by upwards of five engines, proceeding magisterially along the tracks only a few yards from the main road. We had long become accustomed to gargantuan trucks hurtling past us in excess of the speed limit, but this was something else, something that I had, clearly erroneously, thought was a thing of the past in the land where the automobile is king, when hobos rode the rails during the Depression. If the sight was not awe-inspiring enough, the sound of the train’s deep, mournful whistle sent the same chill through me as only the bell of the Campanile di San Marco in Venice had previously done. We drove through Grants on The Mother Road past a series of uninspiring motels, eating establishments and local businesses with such exotic names as Tim’s Muffler Service, Loeffler’s Guns and Handy Andy Quick Shop before turning back onto I-40 (the two roads, and for that matter, the railroad were rarely far apart) for the short drive to Milan. It was nearly 12.30pm and last night’s rib eye steak was long forgotten. This was not the first time that the romance of the road and the anticipation of what might await us over the horizon had overcome any hunger. 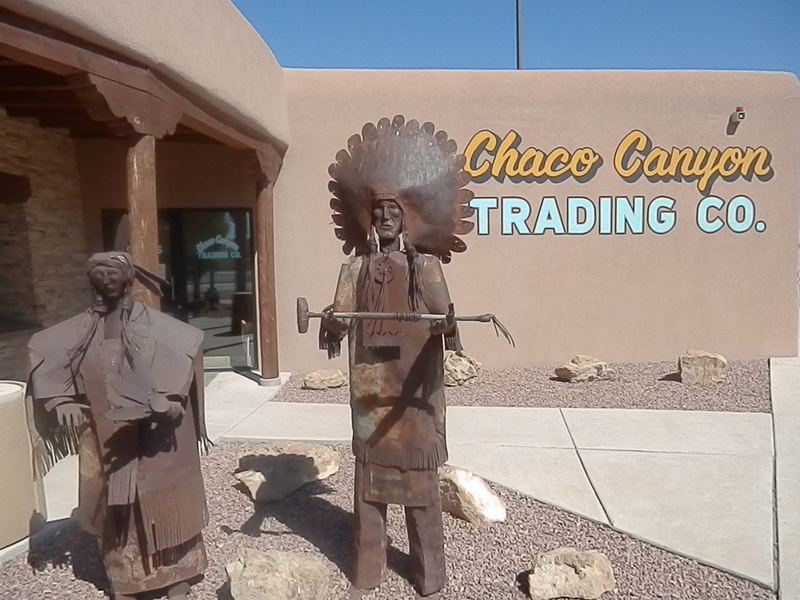 As we were about to swap the frontage road for the interstate again we spotted the Kiva Cafe and adjoining Chaco Canyon Trading Company. Having had no breakfast this would effectively be the only meal today before dinner. That was my rationalisation anyway for indulging in the Chaco Cheeseburger with bacon, fried egg and steak fries. Janet plumped for the much healthier guacomole wrap (though I do recall the mysterious disappearance of a number of my steak fries). Waiting for our meal, we became reacquainted with our friend, Ben Goode, whose books had graced the diner in Mesquite on our first day on the road. Intriguing titles such as How to Make People Think You’re Normal, Men Exposed and The Joy of Being Broke were propped behind the condiments on our table. The diner is truly one of the marvels of American culture, and especially of the road, and this was no exception. Wholesome, inexpensive food, friendly service (our server, Monique, was lovely), unlimited coffee and the opportunity for some serious people watching – an unbeatable combination. Moreover, they perform the valuable service of reminding us that we are not as fat as we thought we were – a condition that could only be sustained if we did not visit such establishments too often. The couple at the next table were a case in point. She was probably in her late forties, around thirty stone with long greasy, grey hair, the number of her chins only marginally surpassed by the amount of zits on her face, and wearing a voluminous flowery blouse and tight denim shorts. He must have been in his seventies, around half his companion’s weight and wearing check shirt, blue jeans and USA baseball cap. They satisfied themselves with huge sodas whilst they waited for their meal, a vast morass of nachos and salsa that they were still devouring with relish when we left. 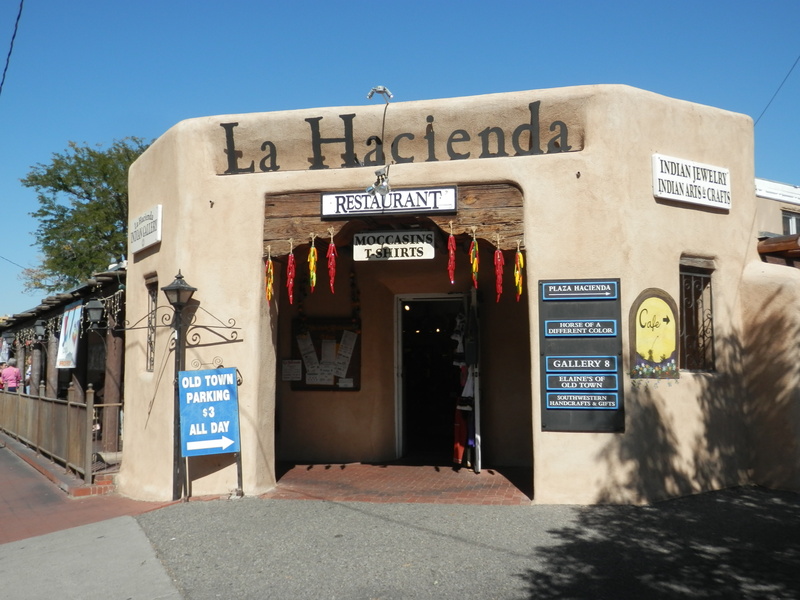 The restaurant was adjacent to a new, sparkling adobe-style trading post where local Native Americans worked at their craft a few feet from the counters that displayed the finished products. 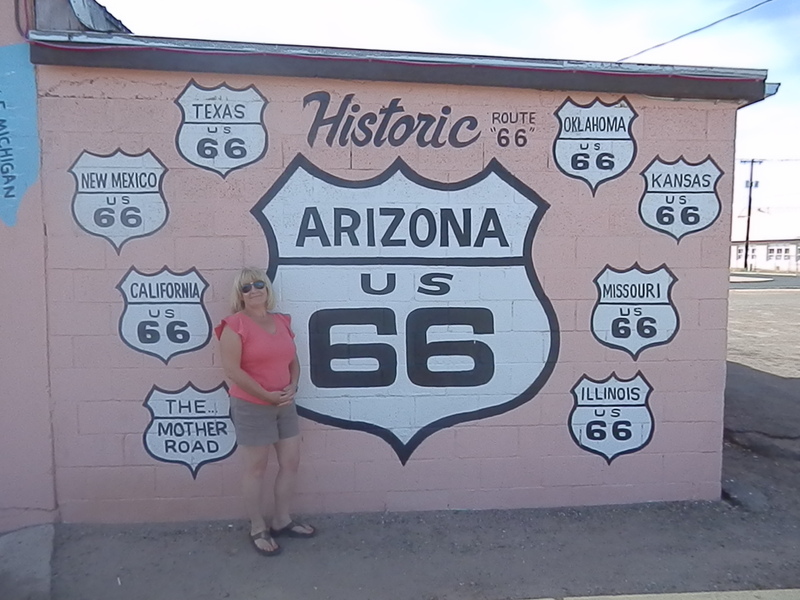 Initially resuming our journey on the interstate, we soon spotted another stretch of old Route 66 to explore. 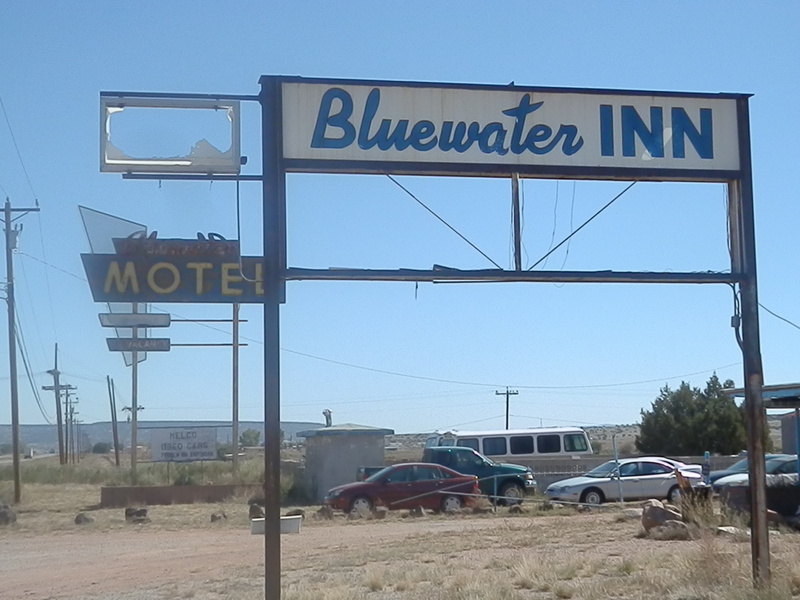 The Bluewater Inn and Motel lay derelict, an all too common sight on the road’s (approximate) 2,448 miles, and one we were to witness several times again in the next few days. But there was some life left in this particular old dog. 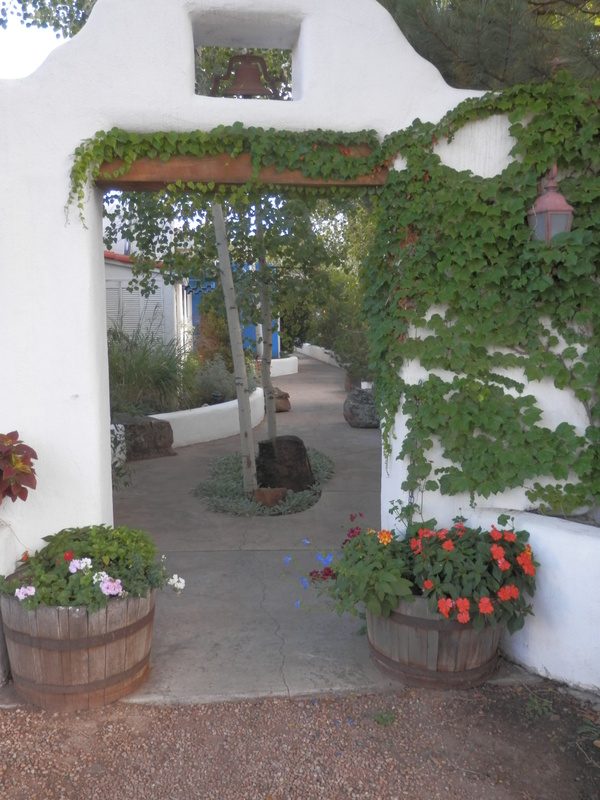 The inn and motel had long shut up shop but the sight of a couple of dozen used cars, pickup trucks and VW microbuses indicated that there might be a business going on here. Indeed, as I stepped out of the car to take some photographs of the wistful scene, an elderly man in a Chevy pulled up alongside and invited me to “take all the pictures you like”. At first I thought he was being sarcastic and that this was his way of telling me to skedaddle, but he seemed genuinely friendly, adding he was “just trying to make a living”. 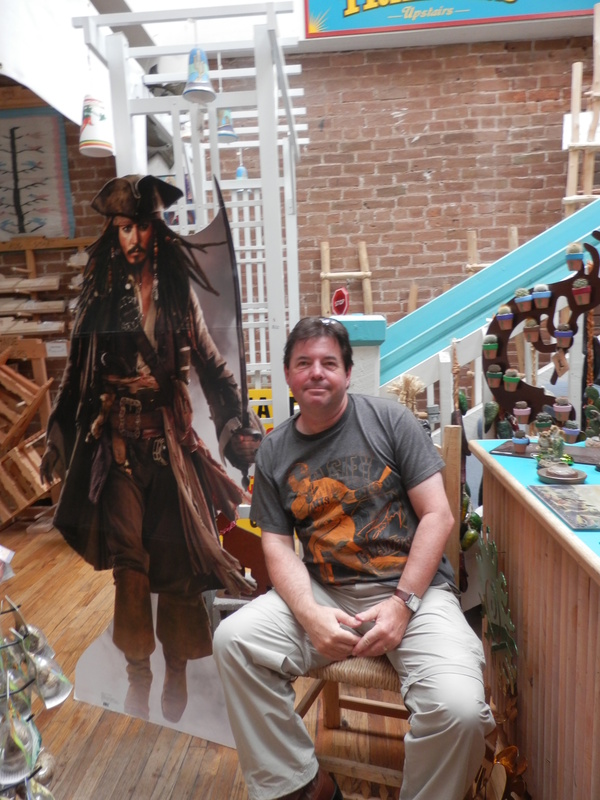 We pulled away, hoping that he would make a sale that day. 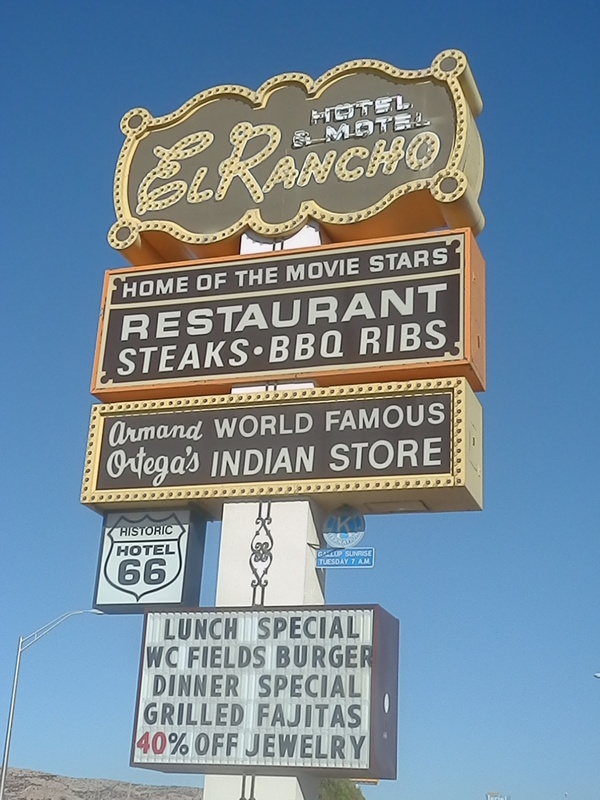 Back on the I-40 and with fifty miles to go to our destination, billboards advertising the El Rancho Hotel in Gallup, “home to the movie stars”, started to appear. Another mile long hot dog of a train trundled past a mere thirty yards away from us. 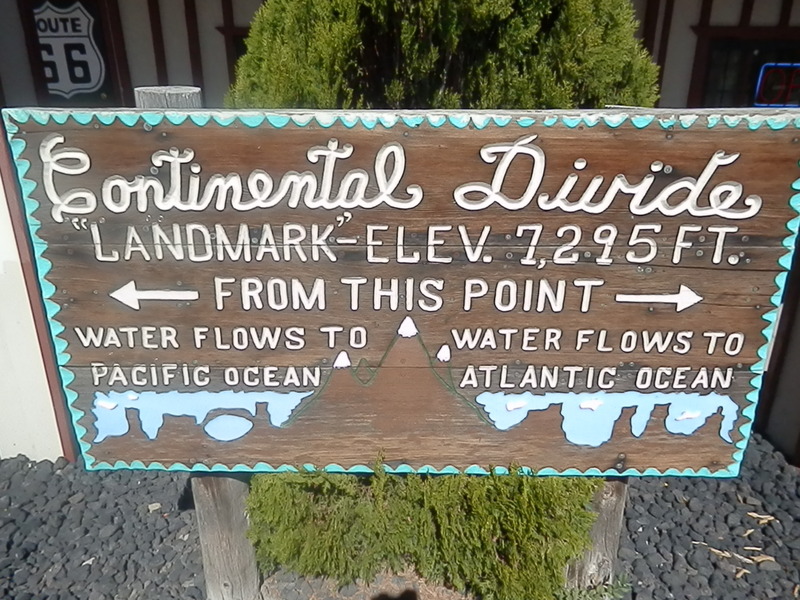 Banks of mesas re-emerged as we passed through Prewitt and Thoreau before reaching Continental Divide, where a line of highly elevated terrain causes rainfall on one side to drain away to one body of water and the other to a different one, in this case the Pacific and Atlantic Oceans. 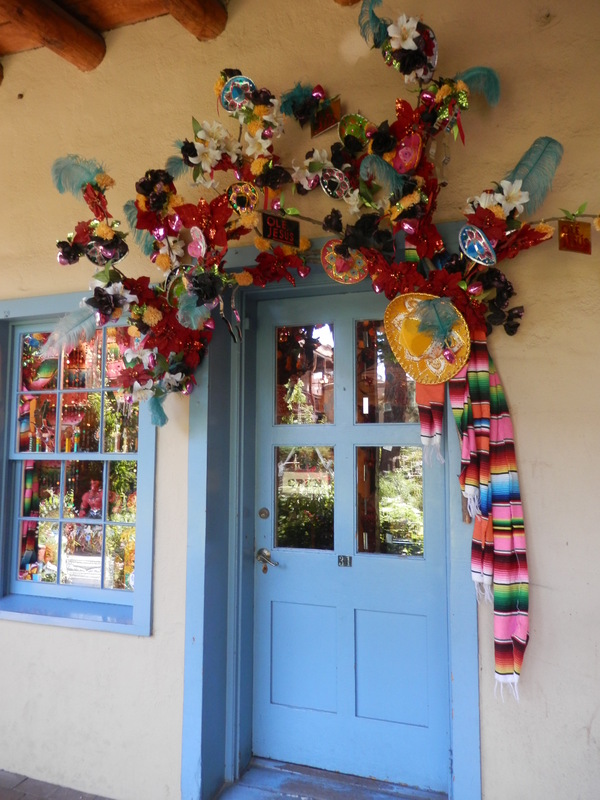 The number of signs extolling the wonders of the El Rancho Hotel were only exceeded by those recommending a stop at the Indian Market. However, this was a classic example of product marketing over the quality of the product itself, though I did succumb to purchasing a Route 66 t-shirt. 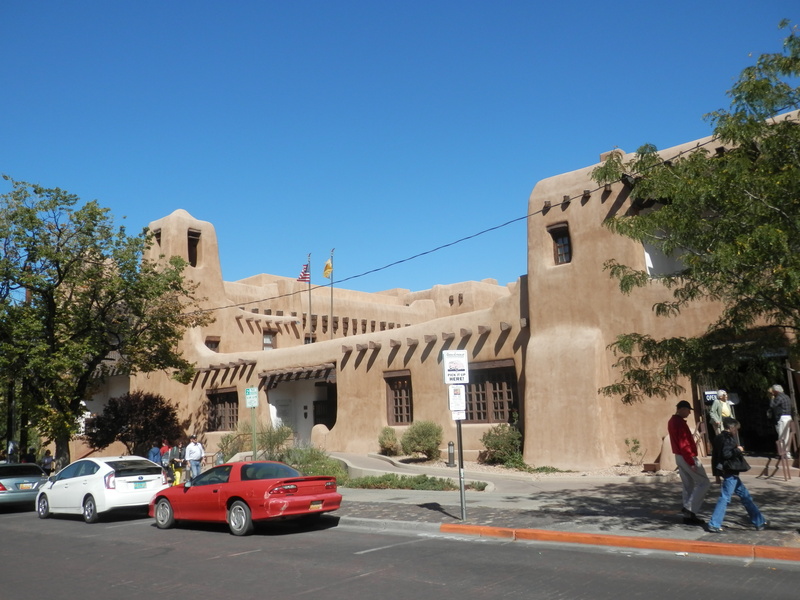 We passed the towns of Gonzales, Wingate, Iyanbito and Church Rock before leaving the I-40 one last time to arrive at the El Rancho Hotel on Historic Route 66. 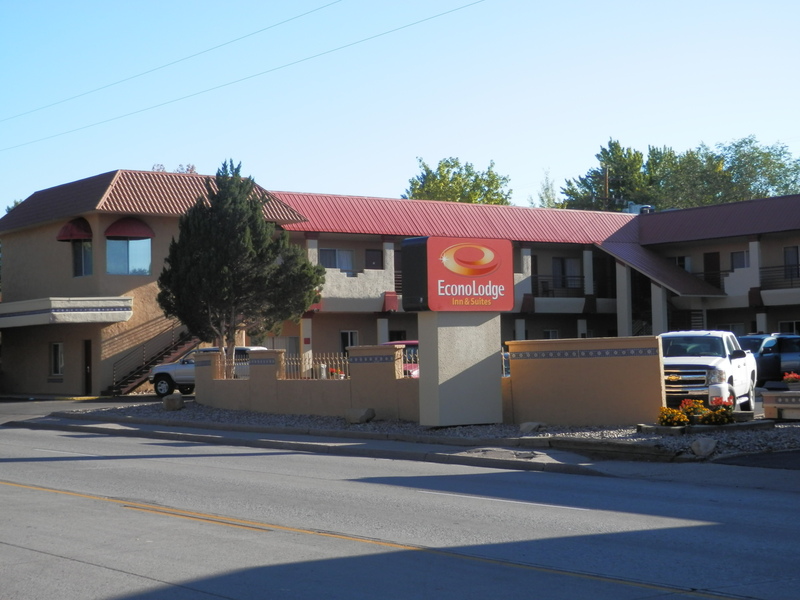 When we had booked our overnight stop, our guidebook had insisted that, because of its historic significance, this was “absolutely the place to stay” in Gallup, despite the presence of a number of considerably cheaper motels. 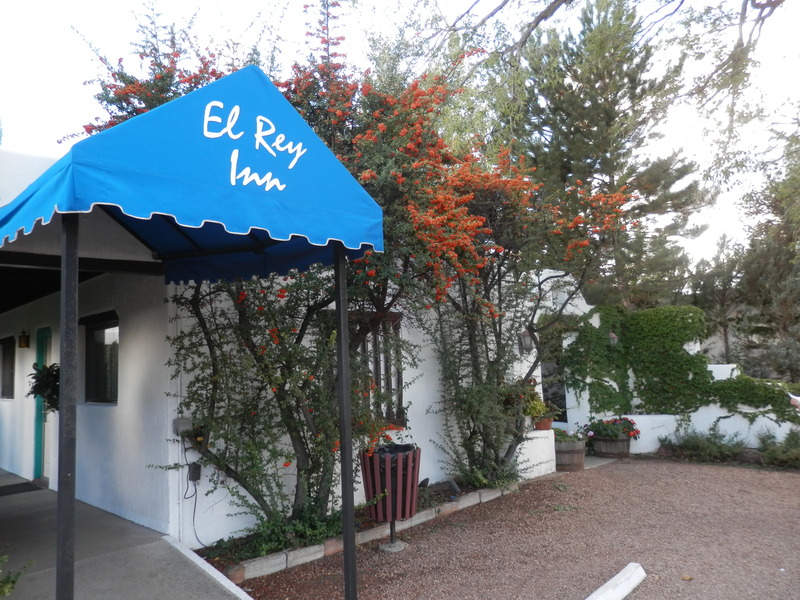 A member of the National Register of Historic Places, the El Rancho, with its slogan “Charm of Yesterday, Convenience of Tomorrow”, had provided a bed for dozens of movie stars from the golden era of Hollywood whilst they were filming in the area. As we wandered down the corridors on each of its three floors, we encountered rooms named after just about every actor and actress that had graced the silver screen either side of the second world war. JohnWayne, Katherine Hepburn, Spencer Tracy, Joan Crawford and Kirk Douglas were just a few. 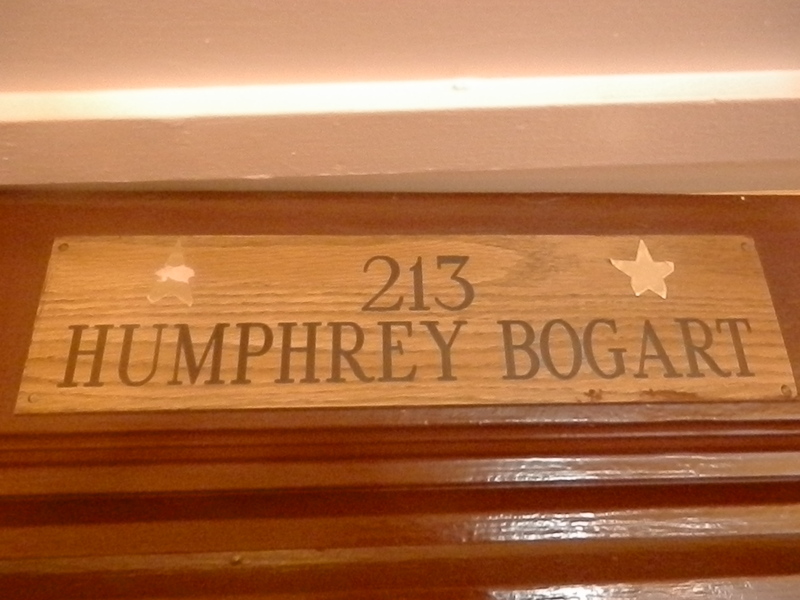 I fully expected us to be given the one room that commemorated an actor we had never heard of, hence my surprise and delight at having been allocated the Humphrey Bogart room! Sadly, the reality did not live up to the star billing. This was palpably the worst room we stayed in on the entire trip – dark, cramped, small bed, tiny bath, no iron/ironing board (cut-off versions only available at reception) or tea or coffee making facilities – and the wi-fi was temperamental. Moreover, the evening meal in the restaurant was bland and the bar dark and expensive. But hey – it was steeped in history, and it is that that the hotel trades on and derives its undoubted success from. And that is why we chose it. 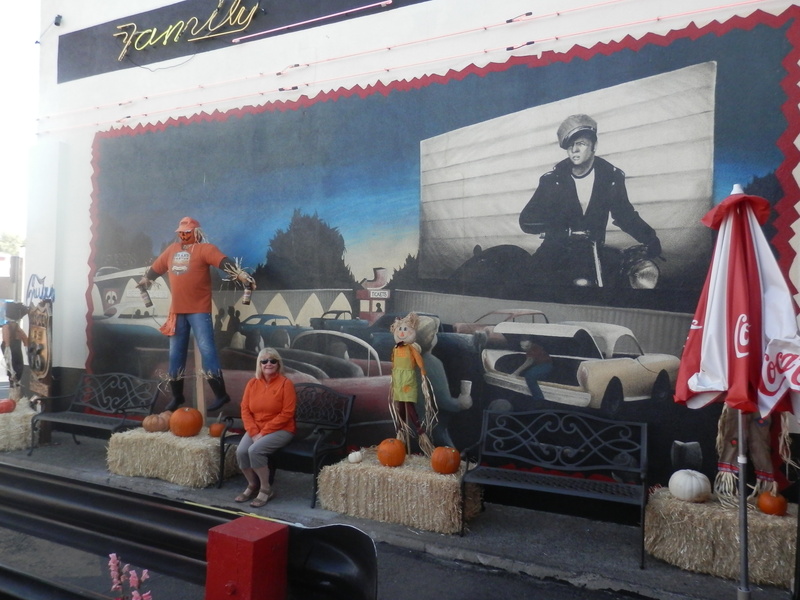 And to be fair, it had character – the saloon-like lobby / lounge, the Indian store, the framed photographs of the movie stars and the murals depicting western scenes all contributed to an authentic atmosphere. It was just that many of the convenient features expected by modern travellers were missing, perhaps intentionally so. And the size of the rooms was a major constraint. 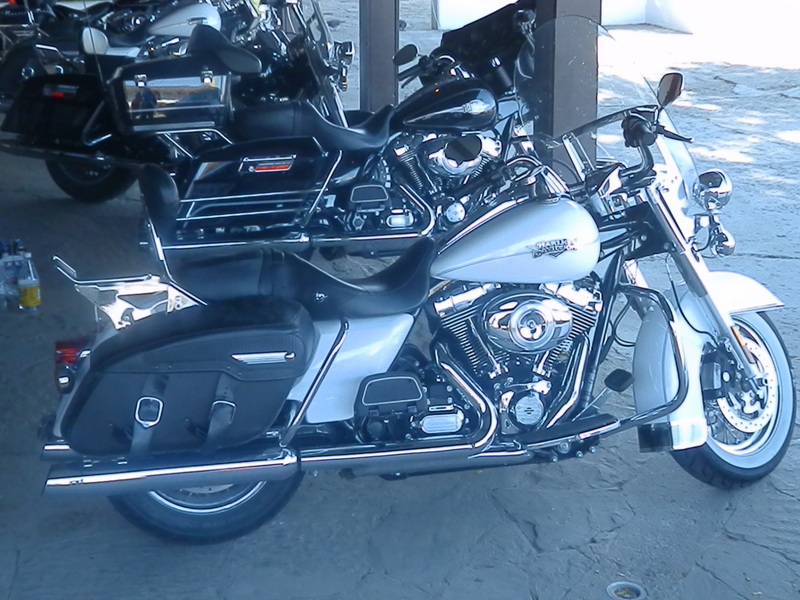 If any evidence was needed that we had now enrolled in the army of Historic Route 66 devotees, the line of Harleys parked outside the hotel sealed the deal. Once we had squeezed both ourselves and our luggage into our room we walked along the road to Goodfellas Sports Lounge. To describe it as dingy and characterless would be an understatement, but we received a friendly enough greeting from the three good ol’ boys sat talking football and politics at the only other occupied table. Fortunately, Joe Pesci was not around at this time. And the Coors light beers were refreshing after a day on the road. 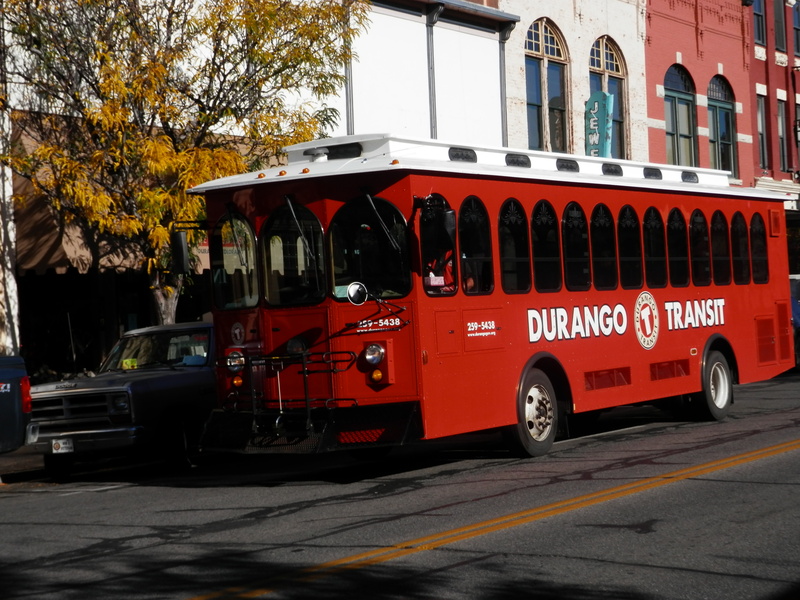 Whilst the bar might have been expensive, two (very) large Jack Daniel’s went some way to erase the memory of a disappointing dinner, as well as induce a reasonable night’s sleep, only interrupted periodically by the baleful, beautiful whistle of the Burlington North and Santa Fe Railroad. Now that’s almost worth being an insomniac for!